My swap from road bike to mountain bike and back to road bike has been guided by where I live more than a preference for either road or mountain. Pushing the pedals around is all! I currently live in London, which is not known for its mountains, but is known for its traffic and its drivers with a loathing for bicycles. So, what’s my current preference? Small quiet lanes, jeep tracks and anything that is rideable on a light bike with limited suspension. You can call it Adventure road riding or Gravel riding and its competitive cousin is Cyclocross, but for all I care you can call it Bob! The first adventure road bike that caught my attention was the Cannondale Slate (drop handlebars, with 3cm of suspension in the front fork and 26” rather than 700c wheels). I was intrigued but when I saw it in the flesh, it seemed more mountain bike than road bike, and anyway I wasn’t ready to part with so much cash. The next thing that caught my eye was the new suspension system in the stem of the Specialized Ruby/Roubaix, and when I heard that it was being added to the 2018 Diverge range, I had to investigate. I rang the Specialized Concept Store in Ruislip and what happened next is something that a friend of mine would describe as ‘the planets being aligned’. It resulted in the creation of the Specialized Diverge ‘Lava’. Paul from the Concept Store answered the phone, and quite by chance owned a Diverge, but that’s not all. Last year he took his bike to Hawaii to climb Mauna Kea one of the most extreme cycling climbs in the world, and to give himself the best chance of completing it, he increased the ratio of the rear cassette from 11-34 to 11-36 teeth (which necessitated changing to a long cage derailleur to cope with the extra chain length), and he also changed from Shimano to SRAm. On his return he replaced his volcano climbing set-up for something more moderate and so had a once-used part SRAM groupset sitting under the counter waiting for a new owner. The reason I discovered this was because at a certain point in the conversation, I told him that what I really wanted was SRAM double-tap gears with a wide ratio rear cassette (which is on my current bike). It must have been music to his ears. A deal was struck. I love the fact that parts of my bike started their useful life on the flanks of a volcano and there really was only one suitable colour for the bottle cages, molten lava! Maybe one day I’ll do Mauna Kea, but slowly …….as is my way! Although the Men’s Diverge Comp arrived in the UK in the latter half of last year, I wrongly assumed that if I waited long enough someone would import the Women’s Diverge Comp (partly because I didn’t want another white bike and also I wouldn’t have to change saddle/handlebar so less cost, and hell, I am a Women so why wouldn’t I want a Women’s bike?!!). In the end I realised it was Men’s model or no bike. It is frustrating to see that Specialized has created a model for Women, but for it to be un-available in the UK. For me, it is one of those chicken and egg situations; are there less Women specific bikes (in the UK) because there are less women cyclists, or are there less women cyclists because there are less women specific bikes? Whilst I’m on the subject of Women’s specific bikes, something which is often overlooked on a Women’s bike is the gearing. An average Women’s legs are not as strong as a Man’s but the gearing rarely reflects this. You could argue that this leads to Women having super-strong legs, which is great if you are fit, confident and very competitive, but I worry that a lot of women who start riding are put-off the hilly sections because the bikes lowest gear is too high to maintain a sustainable pace, which makes climbing hills more painful than it has to be, and ultimately off-putting. Avoiding hills because of this affects your enjoyment of the sport. Nuff said! I have to add that I chose Specialized bikes because in my opinion they lead the way with Women specific bikes, although a lot of other brands are getting with the plot! Chain – Extra long Red chain! Pedals – Rusty Shimano SPD’s! Saddle – Myth Sport Saddle WMNS. After my first 20 mile spin back from the bike shop I am thinking about reducing the stem length, but apart from that it is a dream of a bike, super comfortable. Pictured Right is Paul measuring me up for a saddle. The two blue blobs on the screen are my sit-bones. Who’d ‘av guessed! I opened the living room door to find a room full of people on their mobile phones interacting with a quiz show on the telly. There were disney-esque purple princesses throwing green slime at astronauts, gaudy castles and exploding pyramids, all set to tension-inducing synthetic music, which increased in pace and pitch as the contestants neared their goal. I had landed on another planet. This is a blog about going on a walking week-end in Snowdonia, but really it’s about enjoying the hospitality of strangers, making new friends and ‘getting over myself’. The Snowdonia weekend was planned as a ‘leg strengthener’ for a trekking holiday in Nepal, as well as an opportunity for the group of 4 intrepid trekkers to get to know each other. I was a friend of Kate, and Kate was a friend of Nicki and they were both friends of Adan, whose parents lived in Chester and kindly agreed to put us all up for the weekend. And so it was I found myself north of Watford Gap on a Saturday night, sitting on a sofa wedged between two phone-wielding contestants of the PS4 quiz game called Knowledge is Power (I’ve just googled it). My phone is always telling me it is running out of space, and anyway surely joining in would not only expose my ineptitude with my mobile phone, but also my appalling memory for general knowledge? The mere thought of it made my palms sweat. After half an hour and a bit of deep breathing, I started to relax. They weren’t going to judge me or throw me out into the sub-zero temperatures for not taking part. I realised that if I had had the guts to compete, the experience would have been less confronting, but by the time I ‘got over myself’, they presented me with another challenge; Cards against Humanity (which I had vaguely heard of). For those that don’t know, Cards Against Humanity, is described by Wikipedia as a party game in which players complete fill-in-the-blank statements using words or phrases typically deemed as offensive, risqué or politically incorrect printed on playing cards. I’m not going to say I wasn’t shocked by some of the cards, but it did bring a tear to the eye, and what’s more I won! Oh what hidden depths. I feel I should at least mention the walking at some point, but not before confessing that my favourite game of the weekend involved me humming ‘I don’t like Mondays’, which it turns out was quite beyond me! Enough! I sat on the top of Moel Famau, admiring the views to the snow-capped Snowdonian mountains, watching families and dogs milling around the popular summit. There were whole families out for a pre-lunch amble complete with Gran, all marching their way to the top, most of them wearing clothes that you’d do your Saturday shopping in. Not a grumble to be heard. I couldn’t help thinking that if we were south of the Watford Gap, few would have braved the -10 degree wind chill, and those that did, would be kitted out with clothes that cost the earth and were suitable for an expedition to the arctic. If I ever need a break from the over-entitled, over-stated and over-crowded cool of the south, it’s only a train ride away! My thanks to Adan and this parents Jeff and Paula, for feeding us, driving us around and most of all for welcoming us into their home and allowing us to share (and win) their family games! If anyone is interested in following the Nepal Trek, please follow this blog (either by email or wordpress) and await the next post! Adan is doing the trek for a charity called Action Tutoring, an education charity that gives free tutoring to disadvantaged kids. He has set up a charity giving page here. It was time to forge further east along the Thames and pick up a Thames-side route from Dartford to Rochester, and with the days getting longer and the weather forecast set fair, I seized the day. My mission was to stick close to the Thames with the main attraction of this stretch being the Hoo Peninsular, which has a lonely but beautiful ‘other worldliness’ to it that is similar to other flat and forgotten corners of the British Isles (like the marshlands around Dungeness). I was particularly lured to a remote section of path marked on the OSM outdoors map as ‘Curlews, Convicts and Contraband’. The route to this remote section included a lot un-surfaced tracks with a few potential ‘dead-ends’ which needed investigating, so I set out knowing it wasn’t go to be easy, even if it was flat. Click here for route map. Wobbly moment under the QEII bridge. I started out from Dartford station, which is now becoming quite familiar, and picked up a path that ran alongside the River Darent. I followed it’s wiggles to the Thames and the Deptford Creek flood barrier, before heading east over the Deptford marshes to the Queen Elizabeth II bridge. The marshlands where packed with birds and flys and, as I coasted along the river path, I approached a photographer complete with tri-pod and all the accessories, assuming that he was filming the wildlife. Alas no! As I got closer I spotted a scantily clad lady in heels definitely not designed for bird-watching. I was tempted to look back, but didn’t! If that wasn’t enough to make me feel queasy, riding next to the massive legs of the Queen Elizabeth II bridge, brought on slight vertigo. It was all too much this early in the day. Onwards to the Thames-side towns of Greenhithe and Gravesend, which were crammed with the kind of history that fascinates me. Due to it’s position on the river (being the first easily accessible dry land) it was the International departures and arrivals point for ships bound to all points east, from the huge ships of the East India Company in the 1600 & 1700’s bound for China, Indonesia and India, to the Australia-bound ocean liners taking £10 poms to a new life in the 1950 & 60’s. I stood on the promenade at Gravesend thinking of all those people setting off and returning from massive life-changing adventures over the centuries, and it made the hair on the back of my neck stand on end. I picked my way out of Gravesend, choosing the path that runs along the Thames, rather than the Sustrans route 1. It involved a couple of styles and gates and the odd patch of bog, but was 90% rideable. The path led to Shornemead Fort, which was built in the mid 1800’s but has since been demolished and is now a gallery for graffiti. An interesting mix of old and new, with framed pictures of the Thames rolling by, through the fort casements. From there I decided to make a detour inland to find an easier surface to ride on, which led me to a mobile cafe serving up anything fried with tea, coffee or a sugary drink. Perfect! It was next to Hoo junction, and as it was at the end of an un-surfaced road on the edge of a marsh, it didn’t have a FB page, and rarely gets a stranger. Bacon butties were good! Looking East along the Thames from Shoremead. The white dot shimmering on the skyline is an approaching tanker. From here, things got a little wild. A local cyclist warned me of the disintegrating path around Cliffe Fort but I decided to go for it. How else was I going to get to the Curlews, Convicts and Contraband section? The path around the front of the fort had indeed been swallowed up by the Thames and had been diverted through a sand and gravel works, via another flooded section of path. Having negotiated it without getting my feet wet, I was then faced with an extremely narrow over-grown section, which thankfully only lasted for around a 100 metres. Having passed these tests, the Hoo Peninsula lay before me, in all it’s …….flatness! The path ran parallel with the Thames but on the marsh side of the flood barrier, so although the surface was reasonably fast, the views where so similar for the next half an hour that I ended up thinking I was stopped and the scenery was moving. I was completely alone for the entire section. Just me, the reeds, the vast sky and a load of Curlews and Sky Larks. I couldn’t help feeling that I needed to be a few metres above sea level rather than below, for a truly enjoyable experience. By the time I got to the Curlews, Convicts and Contraband section of the track, tiredness had kicked in, and all I felt was an urgent need for a bit of tarmac. Ho hum! Once back on the black stuff, and having stopped for some dried mango and flapjack, I was feeling more together but decided not to go to Grain as I didn’t want to hit rush-hour back in London. The Hoo Peninsular to Waterloo East at rush hour, what a contrast! I meandered along the coast through Hoo St Werburgh to Rochester, where I boarded the train home, and had the dubious pleasure of sharing my carriage with some Boys from Westminster Cathedral Choir School. I learnt some new words, but won’t be sharing them here, in case my Mum reads it. The longest mileage on un-surfaced roads yet undertaken on my road bike. It was a hard 67 km, but I certainly don’t regret any of it. When I do it again I will include more landward small lane sections, through Cliffe, Cooling & St Mary Hoo! Anybody considering doing the section from Cliffe Fort to High Halstow needs to be able to lift their bike over a number of 5-bar gates! I’ll only load a tamer version of this ride onto The Rides page. This ride includes a section of coastline close to Halstow Marshes which has been altered as recently as October 2016, by building a new more landward sea wall, breaching the old sea-wall and allowing an area of the marsh to revert back to intertidal mud-flats. It was the largest controlled breach of a flood wall in the UK to date and you can read about it here. Even the Ordnance Survey Maps have yet to be altered, so my red-line on the map below may well be the first published up-dated map! Alison Dex braving the first ford. …….and so it came to be that I found myself on a road-biking holiday in Calpe, a resort just along the coast from Benidorm. I had confessed my love of the road less traveled to the group leader (Keith the honorary Bella Velo), so he was prepared when I veered off down a bumpy track as the rest of the group sped-off on beautifully smooth tarmac. I had planned a couple of rides before I arrived. Here is a description of the ride I completed on the last day. The roads out of Calpe have one thing in common; they are all up-hill. Not particularly unusual for a coastal resort, but they do go on a bit! Having examined various maps and overlays I worked out that the least painful way out of town for an adventure road-biker involved a ford crossing, which in normal conditions would have been nothing more than a trickle, but having had over 2 cm of rain earlier in the week, the waterways were a bit lively. This turned out to be a recurring theme throughout the ride. I managed to convince one of the Bella Velo ladies to join me for the first section of the ride, and here she is fording the first stream. Thanks Alison! The weather was sunny but with a slightly Siberian bite to the wind which kept us moving. Up the lane, along a short section of Main road and onto the Serra Bernia road. Regardless of whether you are a pure roadie or have off-road inclinations, I think it would be difficult not to enjoy riding this road. It quietly winds its way along the side of a hill with great views of Calpe and the coast, before turning towards a craggy mountain ridge, eventually descending into a valley which leads to the small town of Xalo. It would be wrong not to mention the 3 km ramp section with gradients of 13 to 15 %, but hey, things of beauty are often cruel! The end of the road …..and another river crossing! After arriving in Xalo and warming up with piece of apple cake, a cafe con leche and much hovering over a wood burner, I left my roadie friends and headed out along the road to Liber. I took a left just before the village and followed the River Xalo along a small track on the valley floor, fording the river twice as it wound it’s way down the valley. The river crossings added to the charm and challenge of the section and I did manage to keep my feet dry! The road was rideable apart from the first 100 metres which had been washed away, and although it wasn’t the easiest of surfaces, I cycled past pretty bamboo groves and colourful river cut cliffs, until the track eventually joined the main Gata de Gorgos road. The main road to Xabia was long, straight and busy with a very limited hard shoulder, so I was glad I had planned an alternative route, which on any other day of the year would have been as dry as a bone. Not today, in fact sections of a stream had chosen the road as it’s preferred route. It made for an interesting ride and took me to the outskirts of Xabia; a coastal town and part of the continuous conurbation that makes up this part of Spains coastline. I am morbidly fascinated by Spains coastal ‘build ups'(! ), so I chose a route which took me as close to the coast as possible but kept to the suburban roads rather than the A roads. This meant a couple of sections of ‘unknown’ to join the built-up areas. Arenal, which was to the seaside of Xabia had a pleasant beach-side cycle path and certainly wasn’t in the Benidorm league of ‘built up’, although you certainly couldn’t describe it as quaint. I left the sea-front and climbed the headland between Arenal and Moraira, passing large well kept houses and gardens. I was certainly in no danger of bumping into Madge from Benidorm here. At the top of the hill my route -finding luck ran-out and I found myself in the middle of a burned out apocalyptic landscape, made up of jagged limestone pavement and scorched trees. The track was unrideable on the uphill sections and exhausting on the down’s, but I could see where I was trying to get to, even if it took me half an hour to get there! I couldn’t determine whether is was fire-damaged or destined for more development, but I was certainly witnessing a land in some kind of transition. I eventually made it back to tarmac and along a mix of pretty country lanes and urban sprawl to the picturesque cove of El Portet and on to Moraira for a well deserved ‘cania de cerveza’. Moraira has a little port and an old town and is like Calpe’s rich relative. I sat at a restaurant overlooking the port nursing my beer and eating the salty nuts and corn thoughtfully provided. This was the last ride of the holiday and as I rode the familiar roller-coaster road back to Calpe, it felt like an old friend and for all my mis-givings about this stretch of coast, I didn’t want to leave so soon. Verdict: A very enjoyable day out. Calpe is not classic adventure road-riding country because it is mobbed with Rapha-clad roadies checking their PR’s, VO2’s and Strava segments, not to mention checking everybody else’s ‘lever length’ and ‘climbing tackle’ (nothing is sacred nowadays!). Having said that, wherever you go there is always ‘a ride less ordinary’. I confess to getting swept up in the world or Strava segments and couldn’t help checking my stats when I returned. Here is what I found! Segment name: Carrer Caravaggio, Climb 31 (aka the apocalyptic section) I was Queen of the Mountains, by virtue of being the only women to have attempted it (on Strava). 64 attempts have been made to date and I come in at number 58. It took me 25 mins (including a photo shoot). The fastest man did it in 10 mins and the slowest (who happens to be called Wim van Wever) did it in 52 mins. Beautiful trails through pine clad hills, gravel tracks up dry river beds, classic road-bike climbs ….. gambas al ajillo, Rioja. I will definitely be back for more! This blog describes my winter escape to seek out some Mediterranean sunshine and to discover some new Adventure road-bike routes in the hills behind Barcelona. Even the combination of Southern Rail and EasyJet didn’t stop my plans for a week away from the grey skies of London, although they did try pretty hard. I arrived outside my Airbnb in the Collserola National Parc at around 8.30pm in a light drizzle, and as the taxi pulled away and my attempts at alerting my hosts to my arrival failed, it briefly occurred to me that I should have brushed up on my Spanish and perhaps booked somewhere a little busier. After the neighbour showed me how to operate a Spanish ‘entry system’ (i.e the bell), my doubts faded, and I found myself in a beautiful loft apartment over-looking a pine and olive clad hill dotted with beautiful Spanish villas. I was already hooked. The first 5 minutes of this ride was definitely the hardest – 30% ascent straight out of the front door, but with a hint of the herby dusty piney smell that signals all things warm and Mediterranean, I wasn’t complaining. I pushed the bike to the top of the hill (fearing cardiac failure or at the very least a pulled muscle) and began the ride winding along a ridge through the Collserola National Parc. Like a lot of the roads in the region, they tend to contour around and follow the ridges where possible, which is great for the views and the legs. The route took me through Floresta and out onto some great trails through the pine forests. Such fun that I forgot to look at my GPS and went seriously off route. The trail stops at El Papiol a small industrial town on the edge of a massive valley cut by the Llobregat river, which starts in the Pyrenees. The valley is a mass of roads, railways and industrial towns, and the sudden contrast from the peace of the forest was quite intimidating. My pre-ride recce indicated a lot of trails along the valley floor, so I headed for the river and found a large track going in the right direction. The gravel and mud jeep-track followed the dry river bed and weaved it’s way past allotments, warehouses, under roads and railways, and was a bit like discovering a secret passage that comes out just where you want it (pictured above left). I eventually emerged onto the start of the road climb up to Ullastrell. Most road climbs in the area have gradients of less than 6% and never more than 7, and this ascent was no exception. Twelve kilometres later I was in Ullastrell looking for a coffee shop. Surely a popular cyclist destination would have one? Ullastrell was perched on a ridge which looked north to the Serra del Colcardus, or south back down the Llobregat valley to Barcelona. I was left wondering why it was a cycling destination, apart from the fact that it was up a hill (funny bunch these Strava cyclists?). I failed to find a central area or a cafe and decided to retreat back in the Terrassa direction. My desire for a coffee and a break was satiated in Can Sola, which could possibly be described as a less salubrious suburb of Rubi. I was entertained by some spontaneous Karaoke, a man trying to train his dog by shouting at it, and a horse-box full of whinnying horses. Weird combination! The coffee was excellent and the cafe owners were very friendly (and tolerant of my appalling Spanish). The trip back was as varied and interesting as my trip out, and I found my self flicking in and out of suburbs and pine forests on quiet roads. As I neared my home for the week, the suburbs became smarter and I came across an old-fashioned grocers shop. It was definitely one-up from ‘open all hours’, but born in the same era. The Spanish lady couldn’t have been more helpful in my quest for the perfect pasta sauce and explained that she had the ultimate sauce arriving next week; alas I would not be there. I wish she had been in the photograph, but here it is without her. A great ride. I was ‘reet chuffed’ that my route finding plans had delivered. 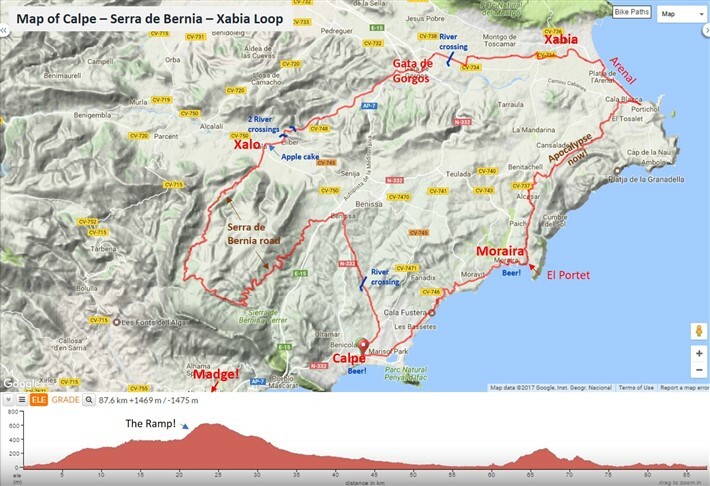 I would change the section around Rubi as it was too busy, and I would also consider continuing to Montserrat to lengthen the ride and significantly increase my chances of finding a decent coffee shop……and see the Monastry, of course! Click here for Ride with GPS map and download. The weather was set fair and I set off for my second ride, this time with a little more local knowledge. I decided that riding up the valley floor was a better start to the day than the 30% ascent to the top of the ridge. Although the valley road had slightly more traffic, it wasn’t busy and I quickly found myself at Floresta, but this time heading out in a different direction. The previous rides forest trails had proven to be totally manageable on a road-bike so I added some more to this ride. Initially I was disappointed because my new route turned out to be a small paved road rather than soft pine needles, but soon enough it turned to gravel, pine needles & compacted mud. I even found myself cycling along a stream bed at one point. Although it wasn’t a long section, it was beautiful; probably made more so by the early morning misty light and heavy dew. The non-paved trail ended at a large mill, complete with millstone next to a large old house with an expensive car in the drive. I knew the road would be easy from now on! All too soon I was back out in the wide open space of the Llobregat valley, with its multiple roads, railways, rivers and industry, but before it swallowed me up, I went through a sweet town on the valley floor called Molins de Rei, which appeared to have kept some of it’s original charm. I was almost tempted by a coffee at a little square but managed to keep my blinkers on for a while longer. My route across and down the valley was straight-forward apart from one very short section where I found myself on a massive 6 lane high-way and suddenly started worrying about how to get off it ….as quickly as possible. Although big, the road was virtually empty allowing me to do a U-turn onto a quieter road. 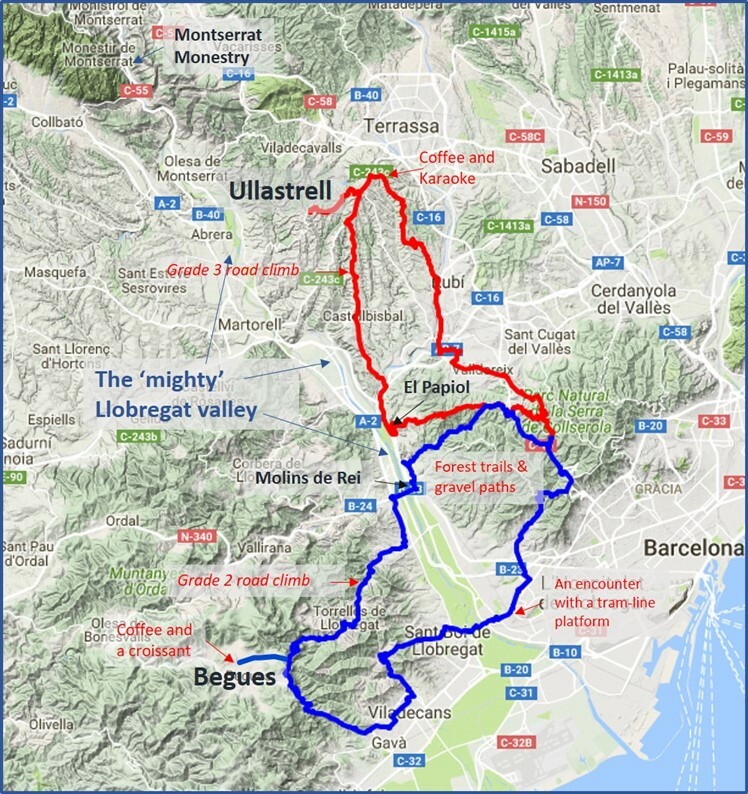 My route along the valley took me through the quiet suburbs of St Vincenc Dels Horts and Poble Neu before I turned up the valley towards Torrelles de Llobregat and faced the major climb of the day, a 400 metre ascent in 12 km. The first section up to Torrelles was a wide road with plenty of room and very light traffic, and past Torrelles the road soon changed to a small paved road with virtually no traffic. The whole section was up a picturesque wooded valley, made more so by the blue skies and empty roads. I was glad of my ‘granny gear’ on the top section though. The valley tops out at a plateau dominated by the town of Begues, and the road climb ends in an attractive old suburb of this town, dominated by large houses with beautifully kept gardens full of Cypress trees and ornamental palms, painted shutters and terracotta tiles. I decided to make a detour into the town and found a modern central square and, much to my delight after yesterdays ride, a coffee shop in the sun with a conveniently placed tree for my bike and fantastic tasting chocolate croissants. This ride was shaping up to be a classic! …….big house, big car, little bike! The fun was not yet over, as I had to make a last ascent into the Collserola National Parc, via a steep track to the top of the ridge. For my last descent, and a perfect end to the day, I found a rideable track through the forest to Valvidrera, before returning to my lofty accommodation and devouring a massive portion of sausage and bean casserole! Even better than the first ride, due to the increased amount of riding in the National Park. I have replaced the section through Cornella tram-line station on the Rides download page. The small section of (very) main road close to Molins de Rei is unavoidable as far as I can tell, but is very short. There are a limited number of bridges across the Llobregat. Still gets 5 stars in my books! I think I’m at the start of a love affair. I decided to ride to a friend’s house in Wanstead a few weeks ago and planned a route that was as traffic-free as possible. It took me through parts of London that I had heard of, but never seen, and I loved it. At one point I was riding alone down a disused canal cut, past abandoned warehouses on a narrow tow-path with a steep drop into a green soupy canal, the next minute I was dodging around the side of hidden marinas and dry docks, and then the Olympic Park full of waterways, bikes paths and strange looking buildings. Yes I am 10 years behind the curve when it comes to discovering East London, but I made it in the end. So with my wheel set firmly towards the rising sun, I set off on another journey of discovery. I planned to ride Quietway 1, which is a new almost traffic-free bike route from Waterloo to Greenwich, and then follow the NCN Route 1 to Woolwich and beyond. The Ride. The route immediately out of Waterloo was slow and busy, with too many white vans doing U-turns, but at least the path was well marked. I was soon beyond Borough and heading to South Bermondsey on quiet back roads, and as I headed further east, Quietway 1 really did live up to its name. I passed the Millwall football stadium, where the biggest visible advertising hoarding was a local funeral directors and it reminded me of a guy I used to go to college with. He was a big Millwall fan and use to show off a mended slash in his leather jacket from a stabwound he had suffered at a particularly lively game! Onward and over the Ha’penny Hatch footbridge, which spans Deptford Creek just before it joins the Thames. Through the railway arch on my left I glimpse a small collection of boats moored on the eastern bank, and to my right a notice on the bridge inviting me to wade through the mud at low tide. For a mere £10 you get a pair of waders and the chance to get really muddy. I’m tempted!. At Greenwich, the Quietway 1 spits me out on the main road in to town. I pass the Cutty Sark, which is always an impressive site, and follow NCN route 1 to a little Thames-side pub, just off the main-stream tourist trail, with the rather unoriginal name of The Cutty Sark. A freshly cooked scotch egg and half a pint later, and I’m back heading east. There are a couple of very big roads to negotiate which the route manages pretty well, and I’m soon back on the Thames path whizzing by a massive aggregates (sand and gravel) depot, with a multitude of conveyor belts and piers jutting into the widening Thames. With a backdrop of the Thames Barrier and the imposing Tate and Lyle sugar refinery on the northern bank, you could never be in any doubt that this is the working side of town. I wonder why I am attracted rather than appalled by such views, and put it down to a lifelong curiosity for how something works. At Woolwich Ferry and I find myself making a split second decision to take the boat rather than the foot tunnel or carry on further east. It is free after-all. The foot passengers ‘quarters’ are below the car deck, all white painted metal, wooden benches and incomprehensible signs which only make sense if you are a ferryman. It reminded me of an oil rig; smelt like one as well! And so to northern shores, and the bit of the ride that I was most curious about. I wanted to stay as close to the river as possible, following the Capital Ring walk around the eastern lock gates of the Royal Docks. I cycled through Royal Victoria Gardens and found my way along the front of the Gallions Point housing complex, and then to the first set of locks. At this point the ride took on a wild and wacky feel. The main lock gates where relatively easy to negotiate but the ones across the Gallions Marina where decidedly dodgy and not wide enough for a bike and rider. There was an alarming gap between the two lock gates which I had to hop over and I found the whole experience rather ‘knee wobbling’. The path out was completely over-grown with rather a desolate feel, and I was starting to imagine finding a dead body around the corner, but only found a pile of laughing gas canisters. Although the maps indicates paths and roads continuing along the Thames, most of them no longer exist, and I kept ending up at the back entrance to a Tescos Extra. However much I tried to continue along the Thames, in the end I drew a blank and conceded defeat. I turned landward towards the Greenway, a recently opened traffic-free route along the top of a sewer pipe that runs from Becton to Stratford. I found the pros of the Greenway (traffic-free, wide, straight, high-up, good views) outweighed the cons (not breathing too deeply when you go past a vent), and any way it is the end of a hot summer so aroma could be seasonal. As it neared Stratford and the Olympic Park, there were some great views of Canary Wharf and Joseph Bazalgettes Victorian masterpiece, the Three Mills pumping station. With the last leg of my trip to go, I felt in need of a coffee so I stopped at the Three Mills cafe for what turned out to be a massive bowl of the stuff. From there to Tower Bridge it’s like an adventure park for bikes, and with a coffee inside me I was whizzing along the gantries, wobbling down the pontoons, taking the curbs to say nothing of the jacob’s ladders and cobbled back streets behind St Catherines Dock. I completed the loop back to Waterloo past the Tate Modern and couldn’t help comparing it to the Tate and Lyle sugar refinery. It seemed like a fitting end to my industrial tour. The Verdict. A great ride. One of the ones that doesn’t need a second or third recce to improve upon. 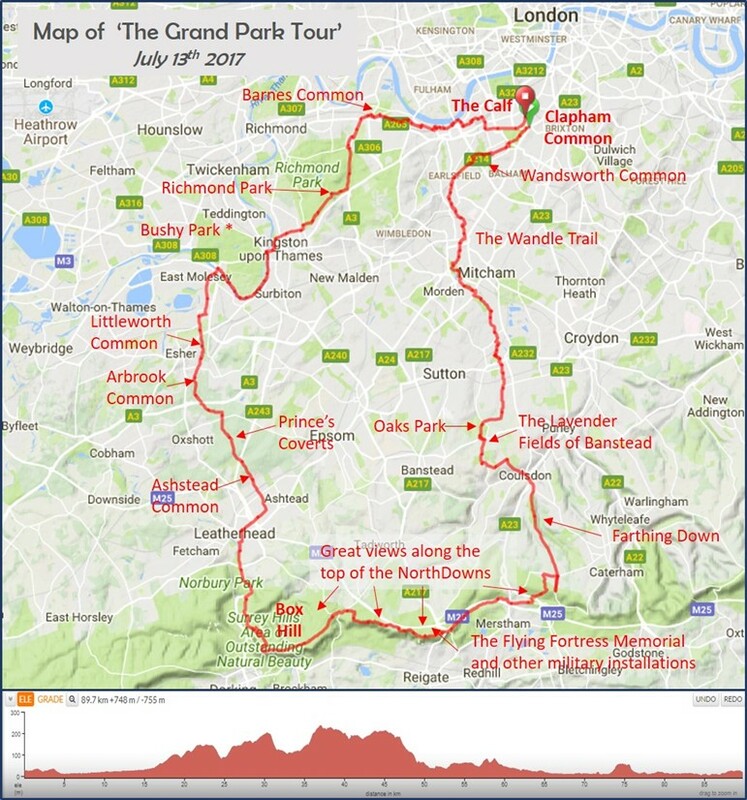 I have two version of this ride in ridewithGPS.com; one which includes the Gallions Point adventure and one which sticks to easier paths at this point in the ride. The first puffa gillet in bronze! Post ride notes: I’m not normally someone who waxes lyrical about history (I was thrown out of history lessons and banned from taking the O’ level) but on my return I couldn’t help googling some of the things I had past and I found myself being totally drawn in by what I discovered. The Ha’penny Hackbridge in Deptford appears to have been the site of The Battle of Deptford Bridge in 1497 and also the final resting place for Francis Drake’s Golden Hind. All of this and more can be found in a blog called the Greenwich Phantom. Gallions Reach, which previous to my ride had evoked a rather romantic picture of tall ships, was actually named after the Galyons family who owned Thames-side property in the area in the 14th century. It was also the scene of the biggest Thames disaster and the site of an Inn that Rudyard Kipling stayed at and you can read more about it on the Hidden London website. Three Mill pumping station was built by Joseph Bazalgette as a remedy for the Cholera outbreaks of the 1800’s. It pumped sewage to the outer reaches of London before allowing it back into the Thames on an outgoing tide. If ever there was a cathedral to sewage, it’s this! Three Mills Island has been the location of a corn mill, a gin distillery, a gun powder plant and is still the worlds largest tidal mill. It is explained in more detail in the London Unveiled blog. I awoke from a terrible nights sleep due to eating a huge portion of pasta the previous evening, and the women in the room upstairs going to the loo at least 3 times. I couldn’t decide between Col de Madeleine (with a train ride) or going up Cormet d’Areches, with the tantalising possibility of completing the ‘Roselend Epic’; a loop ride that included 3 cols and had been taunting me all week. The weather forecast predicted the best weather for the last 10 days, which wasn’t saying much, but I was aware that it was the last good day before my return to the UK. I set off to do Cormet D’Areches, or at least ride up as much of the valley as possible. It seemed more exciting than a train ride followed by an ‘up and back’ route. The Ride. I climbed the small set of switch-backs that Sam and I had discovered in the van, and on through Valezan and Granier. It seemed like I had been waiting an age to ride up this valley, and what had stopped me was a degree of fear for it’s remoteness, coupled with not knowing the state of the un-surfaced road at the summit. I rode past the ‘Cormet d’Areche road closed’ sign, taking no heed, steadily climbing the valley-side above Granier. When I glanced back the view of Mont Pourri peeping through the clouds was breath-taking. It is the highest and most eye-catching mountain in the valley. The road climbed through the tall pine forests and out into the high Alpine meadows. It was the toughest climb of the trip and coupled with a slight headache I kept doubting my ability to make it to the top. I finally reached the end of the tarmac, but the un-surfaced road gave me no excuse to turn back as it was hard-packed with only a small amount of loose gravel. As I climbed higher, my resolve to reach the col hardened, and I started to contemplate doing the ‘Roselend Epic’ rather than turning for home at the top. I decided to change the route on my GPS to reflect my change of plan, but in doing so completely confused the device, and as I neared the summit my ‘battery low’ sign started flashing. Was it a sign? Should I turn back once I had ‘bagged’ the col, or was I just using it as an excuse? After all, I had studied this route so many times, surely I could navigate it by memory? I took the obligatory picture at the top and carried on down the other side. It was only after 500 metres or so, that I realised I had committed to the longer ride without giving it any serious consideration. By now the road was rocky with a lot of loose gravel but as I slowly picked my way down it, I knew that I wasn’t going to turn the bike around. So that was decided then; I was on for the biggest day of my trip. As I turned a bend in the road a whole new landscape opened up to me; the Beaufortain Massif. I was surrounded by 360 degrees of beautiful alpine landscape. Soon back on tarmac, albeit extremely patchy, I swooped passed a huge dam at the end of Lac du Guerin, and on down until I could see the start of the switch-backs up to Col du Pre; a sobering sight. I stopped at the bottom to eat the last of my Tesco’s flap jack squares and an egg from breakfast, washed down with ice cold alpine water, and started the second ascent of the day. It was a short but steep 6 km, with gradients up to 10.6%, and very hot. I stopped at a restaurant at the top for a coffee and a myrtle tart, and filled my water bottle with water that ‘wasn’t always drinkable’ according to the waitress. It was better than nothing and I knew there would be plenty of places to re-fill now that I was nearing a more populated area. 20 kms to go …& the best bit yet to come. So, onwards and downwards again, with the Lac de Roselend in my sights, and soon behind me. I emptied and re-filled my water bottle with icy water from a roadside tap at the start of the final ascent of the day. 7 km up to the Cormet de Roselend, playing cat and mouse with a group of German road-bikers. Their back-up van kept over-taking me and parking up, perhaps thinking I needed a lift. If only they knew how close I was to completing my own personal challenge, and that I would rather crawl to the top with the bike strapped to my back than accept a lift. I realised at this point that, bar a massive mechanical hitch, my mission was almost accomplished. There was just one last thing left to be done, a 20 km descent into Bourg Saint Maurice, and if the last 60 km had blown my mind, then the next 20 took it to another level. No switch-backs here, just massive sweeping turns passing high snow-capped mountains, and valleys begging to be explored. As I flew down the road, tilting into the curves and picking up unrecorded speeds, I felt the pressures of the day lift and found myself singing, and then a lump in my throat. Later, I sat in La Cantina next to the roar of the white water of the Isere river, with a large glass of biere blonde, and realised that nobody knew about my day but me, and for some reason I wanted to keep it that way for a little longer; like someone who’d accidentally stumbled on a nugget of gold. I drank another glass before turning my wheel towards home, after what has to be one of my most awesome days on a bike, ever. The Verdict. Need I say more? Can’t be improved on. Put it on your bucket list! I have since discovered that Cormet de Roselend is considered by some to be in the World top 50 ascents, but I like to think that approaching it from the top and descending it, is even more fun. Another beautiful sunny day. Set off without a plan in the Bourg direction and decided to explore above the village of les Chapelles. The Ride. Arrived at the start of the narrow winding road that I noted a couple of days ago and I’m immediately faced with a ridiculously steep hill. I knew from previous experience that fluffing-up the navigation at this point could ruin the day, so I kept a very close eye on my GPS to check that I was on a road that lead somewhere. The road changed to gravel jeep track just outside the village, but was rideable even with 25mm Gatorskins. I climbed steadily up a series of switch-backs and although I was always in the easiest or second easiest gear, the gradient was consistent and I got into a good rhythm. All was well with the world. The track hit high alpine meadows, dotted with summer huts and pasture and I was particularly taken with one deserted hut with a phenomenal view of the valley. I found myself imagining how it would feel to stay up there for a couple of nights. Me, the bike, a bed, a comfortable seat with a mountain view, a wood burning stove, a water trough and enough food to last for a couple of days. What more could a girl want? As I continued ever upwards, the mountain was mine. I marked it at the top by having a quick pee! At 2000m I was pretty close to the summit of the ‘dome’ and it started to become clear that my mountain was actually the spur of a long ridge which rose up above the snow-line. At the top of the track there was a rocky section probably unsuitable for a car, and then back to hard-pack jeep track. The first couple of km’s of descent were on really annoying large (3-4 cm) loose pack gravel which had been recently laid down and was not yet hard-packed. Tricky for the bike, although I didn’t dismount. Would not be possible to ride without a bit of Mountain Biking experience (unless you are a natural!). The cobbly track eventually changed to tarmac and I stopped to rest my hands. The small tarmac road wound down the hill, eventually reaching Valezan on the D86. I was feeling in need of a bit more than a Tesco’s flap jack square and was just thinking of turning for home when I noticed a little restaurant/bar. After an excellent plate of charcuterie and cheese I completed the end of the Versant du Soleil route, through Granier, Aime and home along the river bike path. The Verdict. I loved this day out, but would probably try to keep high for a bit longer next time I’m out that way. It’s still a worthy ride though. Could take a left hand turn at the top of the switch-backs and come within a short distance of the trig-point at the top of the dome. Why not leave the bike and complete the last bit on foot? (pair of trekking sandals in back pockets?). Set off in fine weather through Bourg and Seez. 30 kms of 5 & 6% ascent on very wide road with very light traffic. Unlike any col I have previously ridden in its consistent but relatively easy gradient. Kept on the big ring (50/32 or 34) all the way. Arrived at La Rosiere, a small skiing village, looked behind me and realized there was a huge rain cloud sweeping up the valley, so decided to press on. Passing large banks of snow on the side of the road, I was very glad to see the top, albeit in the distance. I arrived with freezing rain blowing at my backside and made a hasty retreat to the restaurant, where the waitress showed me to a table next to a log burning stove. Nice. I ate a plate of Tartiflette and watched the rain increase in intensity and reluctantly left after the shower had passed, knowing that I was going to suffer. 10 mins later I couldn’t feel my feet or hands and my knees where like ice blocks. As I descended various body parts came back to life. I decided to take the scenic diversion passed the ‘Route Barre’ sign and duly noted a sink hole big enough to swallow a bike. I also noted Chapelle Saint Michel perched on a little hillock but was too cold to investigate. My first Col of the holiday and a few lessons learnt. Noted some tracks across the valley at the top of the col that looked like potential adventure cycling routes ……on a good day, and later in the season. Note to self: check the weather forecast. I don’t often feel compelled to write about somebody else’s sufferings but reading an article on Victoria Pendleton’s recent suicidal thoughts after her failed attempt at climbing Everest, struck me as unutterably sad. Sad because it summed up so much about the negative aspects of the world we live in (and there is still plenty to be positive about). Nothing I’m going to say is new or radical. I just feel like saying it! For me, it’s about extremism. It has invaded everything we do, from sports to political thinking. The binary world of black and white, right and wrong, success and failure. The pursuit of something to all ends. We live in a world of heroes and villains, where in order to like ourselves we must be the hero. It is a culture that is ingrained in us from the minute we pop into the world and it is getting worse, not better. We judge ourselves and others with an increasingly impossible set of standards. None of us are really 100% hero or 100% villain, we are a crazy mix of everything. Sometimes we succeed sometimes we fail, most of us can be lazy, stupid, thoughtless, deceitful, conniving, inspirational, grateful, generous and loving all in one day, but we only admit to the ‘good’ bits. By doing so, we have unwittingly created a world where it is easier and more attractive for people to pursue extreme physical challenges and mental doctrines than taking on the herculean challenge of liking ourselves ‘warts an all’. I’m not saying this from a lofty position, floating on a yoga mat, with all my chakras in perfect alignment (! ), I understand how hard it is because I find it difficult myself. In fact, if I had been born 15 years later, I would probably be as extreme as everyone else in that generation. I truly hope that VP befriends and grows to love all her demons and conquers her own life. This challenge belongs to everyone. We are all in it together. This is a story about one of my early adventures, in the days when cycling was a minority interest, when the internet and mobile phones weren’t even distant dreams, fuel was something you put in your car and GPS was when you had more than one doctor (oops)! In 1984, at the age of 19, I had survived my first year away from home, and I had my heart set on exploring the west coast of Scotland by bike in my summer holidays. The plan was to stay in Youth Hostels but they were sparse and spread out along parts of the coast, so we took a tent to fill in the gaps. It was the camping experiences which led to some of the most adventurous and memorable parts of the trip, and it’s those that I recount here. My best friend and potential cycling buddy was too busy having ‘an adventure’ with our handsome French exchange student to accompany me on my planned trip north, but somehow, I managed to persuade her 16-year-old sister to come with me. Neither of us had any idea what we were in for, and nowadays it is quite difficult to imagine our level of un-preparedness. August 23rd- 28th 1984, Days 4-9. According to my pre-trip map reading, the section between Invergarry and the Kyle of Lochalsh was particularly wild & remote and the idea of camping somewhere in the middle of this section appealed. I was also in awe of the amount of contours lines on the OS map. Further investigation was imperative! As we set off from Invergarry passing a sign which stated that the next shop was 50 miles away, my sense of excitement grew. We laboured up the long hill past Loch Garry and Bun Loyne to the massive mountains flanking Glen Shiel, and on past Loch Cluaine until at last I spotted a patch of land that looked suitable for camping. I positioned the tent with the door down-wind not realising that it would become an instant shelter for the midges. By 5 am in the morning, we had had enough. It didn’t matter what we did, we couldn’t keep them out. It is hard to describe how it feels to be attacked by midges, but part of the problem is that they are almost invisible, so you sense them in a different way, which easily leads to thinking that you are being bitten when you are not. It became like a mental affliction, with prolonged periods of arm flailing and leg slapping. Packing up the tent was like something out of a Benny Hill sketch. If we ran fast enough we could outrun the midges and give ourselves enough time to pack a little bit more of the tent away, so we spent half an hour running around a midge-infested swamp stuffing various bits of camping equipment into bags and panniers. In the end we were bent double and breathless from laughing as much as from the running around. At 6am we found ourselves swooping down Glen Shiel passed the impressive 5 Sisters of Kintail on a cloudless blue-sky day, and there really was nothing to dislike about that. We coasted into the Kyle of Lochalsh for an early lunch of deep-fried haggis, from the chippy on the harbour. Midges and Haggis, Scotland was starting to reveal itself! By this stage in the holiday, it had dawned on me that if we were going to make it to the north coast there was no time for loitering, so we continued until dusk, around the shores of Loch Carron. We were both so paranoid about a repeat performance of the previous night, we decided not to put the tent up and just laid our sleeping bags along the side of the road, and taking it a step too far, my head faced into the wind. It was rather a cool night under the stars, but thankfully midge free. When we arrived at Torridon Youth Hostel, the bites had had enough time to reveal themselves and a quick count revealed 100 plus bites on each leg alone. Those were the ones that certainly weren’t in my imagination. With 100 miles between Torridon and the next Youth Hostel, over hilly terrain, I knew another camping night was on the cards, but I didn’t want a repeat of either of the previous experiences, so this time I picked a wind-swept cliff top for the pitch. Oh dear. It had the advantage of a hotel near-by, and after pitching our tent (very securely) we retreated to the peace of a completely empty hotel bar and a rather confused barman, who obviously wasn’t used to any customers, let alone a couple of wind-swept young women. He put some money in the duke-box and we all sat there with lumps in our throat listening to his favourite song, a poignant rendition of ‘Amazing Grace’. It was a very surreal moment. Outside in the real world, the weather was whipping up a storm and as we reluctantly left the warmth and dry of the hotel, our minds turned to the challenge of keeping warm and dry on our wind-blown cliff top. We lost this particular challenge and were both awake at 5 am in soggy sleeping bags. It wouldn’t have been so bad if we could have had a cup of tea, but the matches were wet. That’s what did it for me. As we packed up our soaking belongings and got back onto our wet saddles I was kind of wishing ‘Grace would lead us home’; and in a way she did! After climbing steadily away from the sea, we found ourselves on a windswept moorland, but in the distance, parked down a track off the road, was a massive army lorry. I wheeled my bike down the track and banged on the door, way above my head, wondering whether anyone was inside. The window rolled down and a friendly (slightly surprised) face said hello. I asked him if he could spare a match so that we could light our stove and make a cup of tea. He said he could do better than that and did we want a Full English breakfast courtesy of the British Army? Yes please! We all sat in the back of the truck in the warm and dry, opening endless tins and cooking up a breakfast to remember. They asked us where we were going, and did we want a lift? I looked out of the back of the truck into the grey relentless drizzle being blown in sheets across the moor. It wasn’t a difficult decision. We pulled our bikes into the back of the lorry, all squeezed into the cab and set off for Ullapool. After many more toils, snares and weird and wonderful experiences, and having made it from Glascow to Thurso, I eventually got home. Mum was standing at the kitchen sink peeling potatoes and when she asked me how we’d got on, I was completely stumped for words. I was so filled up with the wonders of it all, how could I possible convey it in a single sentence? It was a holiday that shaped my future holidays, and my future dreams. We cycled over 500 miles and ascended over 10,000 metres, in two weeks. But it is never about the metrics to me, either then or now! I say that because in many ways it is true, but when I really think about it in the context of our ages, our equipment, and yes, the fact that we were women and not men, I think it is quite remarkable. We had 3 punctures all mended with a puncture repair kit by myself , because in those days nobody considered taking a spare inner tube!!!! A 12-day trek in the Langtang region of Nepal. A holiday where a line was drawn. There was me before the holiday, and me after the holiday; my post-holiday version of myself being more in awe of nature and what humans endure to live with its relentless change and lack of predictability. Before I disappear into words of pomp, part of my new appreciation stems from pushing myself to new physical and mental limits and gaining a new understanding of my own abilities, but it also stems from observing a nation 2 years after a truly devastating earthquake, that reduced parts of the country to rubble (and, yes, that did add to the challenges of our trek). I have decided to write two blogs of my experience, one which is centred on the Earthquake and it’s natural and human aftermath (still in the writing), and the other is a personal account, which I have called my diary of sufferings. Diary of Sufferings – Four tales from the heart of the Himalayas. It may seem strange to focus on suffering as a way of defining a holiday that was as memorable for it’s beautiful landscapes and funny moments as it was for the tough bits but portraying it as a stream of beautiful experiences would be untruthful. It really was so much more. Just writing this is making me laugh, because humour is a great way of reducing the stress of life’s tougher challenges, and it wasn’t in short supply on this trip, it’s just that sometimes the very best of coping strategies evaded me. The other reason for my unusual focus is that recognising, understanding and overcoming suffering form the core of the Buddhist ideology, and last time I was in Nepal I bought a little book explaining Buddhism in simple terms for a western audience written by the Dalai Lama, some of which has remained firmly in my head. I have punctuated the stories with pictures taken on the trip, roughly in chronological order, to balance the stories with non-suffering moments, of which there were many. Just to ease you in gently, my first story is light-hearted and unapologetically lavatorial. It’s from day 1 of the trip, and in hind-sight was an omen of things to come. Day 1 was never really described on the pre-trip schedule, in fact I was so naïve in my assumptions, that I thought we’d be rising early, popping up the road for an hour or two in a hire car and starting to trek out that day. After all it was only 30 miles from Kathmandu to Syra Besi as the crow flies! Wasn’t it? After 6 hours of bone-jarring rocking and rolling on mainly unsurfaced roads we arrived at Barkhu, which was a mere 45 minutes from our final destination of Syra Besi. Up until then, I had congratulated myself on keeping the contents of my digestive tract firmly in place (as had everyone else, albeit with various shades of green, and self-imposed silences to concentrate on the task at hand!). In fact, there were quite long spells where I loved the adventure of it all. Our wise guide, Ngima, had decided to leave lunch as late as possible for all the right reasons. Despite all of that, when I was finally faced with a large plate of Dhal Baht (Nepalese staple curry and rice), I suddenly felt an urgent need for the loo. This happened to coincide with a dramatic change in the weather and a massive crack of thunder which plunged the toilet into darkness, at the same time as I realised that I didn’t have any toilet paper. From a perspective of recognizing, understanding and overcoming this particular suffering, there are a number of lessons to be learnt. Not drinking the last beer in Tom and Jerries bar on the previous evening would be a good starting place, as well as always having a few pieces of toilet paper in your pocket! On a more serious note, making assumptions, regardless of previous knowledge or experience, inevitably leads to suffering. In other words, it wouldn’t have made much difference if we had known a bit more about the journey ahead because no one can predict the rapidly changing road surface or the weather or if the car was going to break-down. In a country like Nepal, you have to roll with it, and accept your own lack of control. I often think that in developed countries it is easy to exaggerate the extent to which we are really in control, and if that exaggeration becomes too big, suffering is inevitable. So how did I get out of my predicament in the darkened toilet? Well, much to my relief, it turned out to be a bad case of altitude wind!! Okay, too much information. Hotel Lama was a huddle of different tea-houses perched in the narrow valley next to the raging Langtang River and was our first night on the trek. The sleeping accommodation was separate from the dining/living area and at first glance was basic but okay. We joked about the large gaps between the planks separating the rooms. I clambered into my sleeping bag at an early hour, in my tiny shared room with a blue polythene sheet ceiling and two wooden benches with the thinnest of mattresses, and as I wriggled to get comfortable I realised the plank at hip level squealed like a pig every time I moved. I lay there listening to the snorts, snuffles and hawks of my fellow tea-house guests, all joined together by wonky planks, holey floorboards and bits of plastic, and I was half paralysed for fear of disturbing anyone. I tried to drift off, but the last ginger lemon tea was begging for release. I lay there for an hour trying to deny it freedom, then squealed my way out of bed, head-torch on, through the door and out into the cool night, across a rocky outcrop, under a washing line to the comfort of a mud-floored ‘drop and squat’ toilet. I had at least remembered the toilet paper. The bed of doom. Sherpa Lodge. Hotel Lama. I returned to my bed and my fear of movement crept back over me, slowly turning into a whole raft of other insecurities. Why couldn’t I own my space like some people, free of self-doubt and full of confidence, sleeping their trouble-free sleep? No one needs to earn the right to breath or snore or wriggle. When times get tough why do I want to disappear and deny my own needs? Is it too much to ask someone to endure my noisy bed while I find a comfortable place for my aching hips? What if they did complain, what would that say about them? What if I was unable to cope with being at high altitude and become a burden on my fellow travellers, who had all tested themselves at altitudes of over 5000 metres? How was I going to cope with 12 nights like this? What on earth had I been thinking when I accepted the invite? Surely any sane person would have done this in their 20’s not their 50’s. The room slowly filled with morning light, and I was released from my squeaking den. Later, I walked away towards the white water and the massive boulders of the river, looking upwards to the steep valley walls and the blue sky beyond. I knew that somewhere around the many bends of the valley floor lay the 7000 m snow-capped mountains of the Lirung Himal, and in an instant I realised the uniqueness of the opportunity that lay before me. There was no room for wimpery or self-doubt. I had my new boots, a belly full of rice porridge, I’ve got strong legs and a big pair of lungs, and although I might be lacking in the confidence department, I have enough curiosity to fill a football stadium, and that was enough to keep me on track. I hereby proudly announce that I own and take full responsibility for every squeak, sigh, wriggle and breath emanating from the right-hand bed of room 2, on the night of Saturday 31st March 2018 in the Sherpa Hotel and lodge, Lama Hotel. It was me. The last two stories are based on the toughest part of the trip (days 8 to 10), which happened to be going over the Laurabine pass, the first part of which was in a snow storm. After 1 and half days of mainly uphill, we arrived at a tea-house perched on top of a little steep-sided plateau. We were thankful of a rest and some lunch. As we entered the tea-house, the mist thickened to fog, and the temperature started dropping like a stone. Soon large hail-stones were beating down on the tin roof, quickly followed by snow. Within an hour of arriving, our world had been transformed to a total white-out. The un-heated tea-house was as freezing as the outside temperature, and for the first time, I wore my newly purchased down jacket. In fact, I wore every single article of clothing it was possible to wear, and still managed to eat my yak cheese covered potatoes. Leaving the shelter of the tea-house filled me with a childish sense of excitement. I couldn’t remember the last time I had done anything even as remotely adventurous as this. We squeaked our way up the snowy path, climbing upward, and I had the same pain in the base of my right ribcage, that I had experienced when we went above 4000 m a few days before. I couldn’t fathom it, firstly thinking it was related to my stomach. We stopped for a brief re-gathering and as we did so I suddenly lowered my shoulders slightly and found myself taking a massive breath. It was like somebody taking a foot off my chest. The pain in my rib-cage disappeared, and in that instant, I knew I could do it. As we continued up the hill, my mind was filled with a steady beat which matched my feet and my breathing, my eyes were picking out slight changes in the gradient and constantly but almost unconsciously I adjusted my stride length. I was in the zone. I wasn’t the fastest or the strongest, but for a while, I led the pack slowly up the hill and felt my confidence return, because if there is one thing I understand, it is THE ART OF GOING SLOW. Walking uphill at altitude is the same as riding up a long hill on a bike. It is about gauging a pace which is sustainable and being able to continually change that pace so that the energy you exert stays constant (rather than your speed staying constant and your energy level fluctuating). On a bike if the gradient changes you change gear, when you walk you change you stride length, so the steeper the gradient the smaller your step. For me, understanding and practising this, is proof that suffering can be overcome or at least reduced, and it has given me the confidence to tackle hills that at first sight seem unconquerable. This story shows that being confident is being relaxed and learning to be relaxed when you are doing something new is a real challenge. Unfortunately, one afternoons success, doesn’t mean you’ve cracked it ……. This story starts, where the previous stops and is about abject tiredness. As we arrived at the highest tea-house of the trip (Gosaikunda, just before the Laurebina pass), the snow eased, and we were welcomed into the cute and cosy looking tea-house with a respect reserved for people brave enough (or foolhardy enough) to tackle the snowy conditions. The living room may have looked cute and cosy, but unfortunately it proved to be a false impression. The timid heat of the wood fired stove was overwhelmed by the flow of freezing air being pulled through the leaky floorboards. It was a huge effort keeping warm, after such an exertion. Not impossible though. The warmest place, directly in front of the stoves open door was taken by a 78 year old Canadian women, who confessed that this would be her last trek in Nepal. She said that, on the rocky sections it took her too long to decide where to put her feet. It was a sad realisation for her, but she had the respect of everybody in the room. The following morning, with 450 metres of climbing to reach the top of the pass, we set off in sunshine in a snowy wonderland, and I’d love to say that all was right with the world, but it wasn’t. My previous days rhythm and state of mind had disappeared into the cold, sleepless night, and no matter how hard I tried, I couldn’t get back there. We summited the col, and all I wanted to do was get down the hill, which was a tough rocky descent. Lunch was a bad choice of packet soup. I should have gone for the egg and chips! The path from lunch to Gopte, the next tea-house, was tough ‘Himalayan undulations’; short but sharp ups and downs, but I was on a mission to reach an altitude where my body was better able to cope, as fast as my legs would carry me. On arriving at Gopte, I was looking forward to a hot shower, the first of any kind of a wash for 3 days, but the 2015 earthquake had re-routed the natural water supply, making water a precious commodity. The only thing on offer was a small bowl of hot water. I took it to my room, stripped down and started the procedure without giving it enough thought. All I’m going to say is that I washed the dirtiest bits first, then realised there was no point in washing the cleaner bits cos they’d end up as dirty as the dirty bits. I desperately wanted to wash my face and the simple realisation that I couldn’t was the straw that broke the camels back. I couldn’t laugh about it. I tipped my bowl of dirty water down the toilet and returned to the living room, but there was no point in engaging with anyone because they couldn’t see the depths to which I’d just plunged, and I didn’t have the mental energy to share it. I took my cup of chai, left the building and started climbing back up the path we had come down. I rounded a corner so that the tea-house was out of sight and sat on a rock. I was exhausted in a way that I have never felt. All I had done for the last few days was survive and I knew I was still clinging to that mind-set, but as I sat there listening to the various chirps of the birds at dusk and looking at the mist revealing and hiding different parts of the mountain as it swirled its way up the valley, tears welled up and I found my self gradually letting go of survival and allowing myself to come back to life. I’d made it. I’d done enough, and I hadn’t found myself lacking, and sometimes there is no better feeling. As we descended, small villages gave way to bigger villages and the trees changed from stunted wind-swept brush to tall confers, rhododendrons, mountain ash and larch, dripping in moss and lichens. The paths got broader and less rocky and with a body primed for less oxygen the ‘Himalayan undulations’ were a walk in the park. Would I do it again. You betcha! Only next time, I’ll remember to wash the clean bits first. Ain’t no mountain high enough ……..
………Ain’t no valley low enough, except when it comes to Nepal, which has the highest mountain and the deepest valley in the world, and probably a whole host of other records involving height and depth. My impending trip to Nepal, however, doesn’t scale the extreme heights or depths of this mountain mecca, but plots a route along the Langtang Valley, over the Laurebina Pass and back to the outskirts of Kathmandu along a ridge, known as the Helambu trek. The trek in it’s entirety is approximately 130 km, with a cumulative ascent over that distance of around 8800 m (depending on whether we have the appetite to bag a peak on our day off in Kyanjing Gompa). We won’t be pushing a ball along with our nose, strapping a fridge to our backs or doing any extreme ironing, we’ll just be putting one foot in front of another. How unique! I first heard of the Langtang Valley through a guy I went cycling with in Pokhara, who many years later posted a picture of himself carrying his bike up the valley. It was one of those photos that ‘hit me in the chest’ and made my jaw drop. Being a professional mountain biker, he then went on to make a video of his descent which is equally jaw-dropping (and you can see here). The area recently re-emerged into my conscious when my intrepid friend Kate said that she was organising a trek along it. I can’t remember whether she invited me or I invited myself, but anyway, I’m going. You may or may not be surprised to read that I am not taking my bike, but apart from the lack of bike, it bears all the hallmarks of a ‘less ordinary’ adventure. The valley does not attract the kind of visitor numbers of the neighbouring Everest or Annapurna regions, and because it is at a slightly lower altitude, much of it is below the tree line, or at least less bereft of vegetation than the higher treks, and for me, both things add to its attraction. So, on the 27th March I set out for Kathmandu with my new boots, my ancient rucksack and a stash of flapjack squares and emergency tea-bags. Wish me luck! If you’d like to read a light-hearted blog on one of our preparation weekends please click here. If it is route maps and Google Earth Phantasmograms you are looking for, please carry on scrolling! If you would like to help us raise money for Action Tutoring please click on the link here. The target is to raise £3240 for 1 terms tutoring for 30 kids. All donations, however small gratefully received. Here are some maps I prepared earlier. This map details the itinerary, as well as illustrating a vertical section of the walk (along the bottom), showing the amount of ascent and descent per day. Day 1 has the largest amount of ascent, but is at a low altitude. Day 5 and day 9 have a lot of descent, kms and altitude, but nothing too scary (easy to say when I’m sitting at home with a cuppa). This map is a zoom-in of the Langtang Valley section, highlighting the names of the mountains and location of the glaciers. The Red Bear in the corner is on the ‘would like to see list’, but we would be very lucky to actually encounter one. This map shows the location of the Langtang Valley within Nepal, situated to the North of Kathmandu, between the Annapurna Range and Everest (apologies for the miss-spelling of Kathmandu!). It also highlights the fact that there are a gazillion more mountains in the west of the country, that are not in a National Park (possibly because they are not quite so high) that are begging for a little more exploration, even if it is just virtual …..at this stage..
A very sobering aspect of our trek will be passing over the landslides caused by the earthquakes in 2015. It’s impossible to imagine how such a small and decimated community continues to exist, but it does and we’ll be staying there for a night on Day 3. I promised myself that every couple of months I would get out of London and go somewhere different. It didn’t really matter where, Timbuktu or Bognor Regis, just a change of scene. I didn’t make it as far as Bognor Regis, but decided on Lewes, near Brighton. Okay, so it’s not sharing a Yurt with the Dzungar tribe of Outer Mongolia, but it had its challenges none the less, and I always think that one of the un-sung joys of life is having an adventure in your own ‘back yard’. In fact, sometimes I think I could have an adventure in my garden, but I think I’ll spare you that one for now! My 4 days in the wilds of Sussex taught me a whole load of lessons about Winter riding/touring and how perseverance in times of slight adversity brings its rewards! I also continued with my exploration of the towns along the south coast, some of which I would definitely return to and others not! My route was inspired by a map I made of SE England, showing National Cycle Network routes, railways, rocks and rivers, which can be viewed here. The map below is a zoomed-in, slightly amended version of the map showing my tour routes and adventures! As I lay in bed, the night before my departure, I was trying to workout if I could get to Lewes on my chosen route and arrive before dark. I realised that dragging two full panniers over 70 miles, up a total of 1200 metres, against wind gusts up to 40 mph and arriving before 4 pm was pushing it. I hated making the decision to get the train to Sevenoaks (thereby chopping the first 17 miles off the route) because I thought I was wimping out in some way, and I should do the tough option, but as I set off from Sevenoaks, I changed my mind-set from self-chastisement to one of accepting the challenge as I had re-defined it. It was still a challenge. Yes, really. It turned out to be one the most challenging rides of 2017. I was so thankful for my earlier decision. It was a beautiful day, and setting-off from Sevenoaks was a dream compared to slogging through the interminable South London Suburbs. Before I knew it, I was swooping down into the Weald with the days ride spread before me. 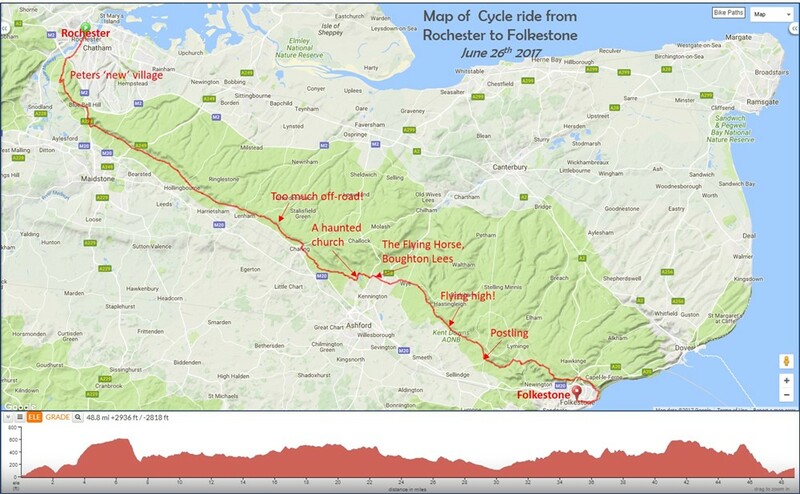 I knew the roads to Royal Tunbridge Wells as I had ‘borrowed’ the route from a previous ride. I stopped briefly at Penshurst and continued on some tiny lanes into the town; not only famous for its ‘Georgian Splendour and lofty spa-town feel’, it also boasts an excellent bike shop, with a really nice cafe (The Velo House). I shared my delicious late breakfast and coffee with other Lycra-clad roadies, most of whom where middle-aged women like me!! What’s the world coming to? A little conscious of the time, I pressed on, picking up the NCN 18 east out of Tunbridge Wells. It was a beautiful quiet, relatively flat flowing country lane until Groombridge, where the route turned south onto the NCN 21, which could only mean one thing; hills! Not the continental ones that gradually wind there way up the side of a valley in a civilized fashion, but the steep, sharp merciless variety that slowly grind you down. I knew that all would be well, once I got to Heathfield and picked up the ‘gently descending’ Cuckoo trail down to Hailsham, the trouble was, that by the time I got to Heathfield the sun was horribly low in the sky, and I still had a long way to go. I’d been looking forward to warming down a little on this stretch, which was a re-surfaced old railway line. Initially my pace was dictated by the huge number of dog-owners and their beloved pooches, but as I slowly picked my way past their dog conferences, I became ever more aware of the failing light and my lack of progress, and ‘Tarquins’ need for space started to compete with my need for a little speed. As I left the village behind, my speed picked up and I started to imagine I was a steam train (!). I tried to stop myself from making a tooting noise through a tunnel, but it was out there before I knew it, and with the last of the sun flicking through the trees on the side of the track, I was going faster and faster, but alas, there was no beating the sinking sun. As I turned west for my final stretch from Hailsham to Lewes, the sun was just setting behind the South Downs and my legs where totally shot. I munched my way through the last of the flapjack squares, threading my way gingerly over freshly cut hedge-cuttings, and prayed for a puncture-free passage. I finally pulled into my Airbnb, in the dark with no front light (flat battery) and whole heap of relief. Always take spare light batteries. Panniers, wind and hills dramatically reduce my speed/timings. Chasing the sun as it sinks behind the South Downs, heading to Lewes. Day 2 Castles, cladding and ….coffee? Recovery day, rode to Lewes, explored the town, Lewes Castle, The Priory, shops, coffee-house, Needle-makers for lunch, bought a pair of warm leggings, a book, some batteries and some Waitrose ready meals. Sorted. I loved the mix of different architecture from the Victorian and Georgian period right back through the Elizabethan to the Norman Castle and Priory (and beyond to the Saxon and Roman, although there wasn’t much left to look at for these periods). I was fascinated to read that a lot of the timber-framed medieval houses had been re-clad with a brick or flint facade in the 1800’s, owing to the fashion of the times. So it turns out the 1970’s craze for re-cladding the front of your Victorian terrace was nothing new. Eat yer heart out Vera Duckworth! Another thing that I found rather confusing was the idea that in Saxon and Norman times, it was a flourishing river port. The river was hardly bigger than a broad brook. I realize that super-tankers were not on the scene but even so, was the river bigger then? There is a quirkiness to Lewes which makes it very appealing, and I found it a very easy town to spend the day in. One website I found put it thus: ‘Sheltered by the forest to the north of the weald and a distance from the main routes from London, south to Bath or Canterbury, Lewes established itself from this early age (Saxon) with an independent spirit and identity.’ I can attest to the fact that it hasn’t lost that spirit, and benefits further from a lack of ‘kiss me quick hats’ and ‘sticky carpet pubs’ that detract from it’s noisy neighbour, Brighton. Glynde place, looking a bit spooky! Day 3 Mud and the River Ooooooze! I planned to cycle over the chalk downs via Firle to Newhaven, and back along the River Ouse to Lewes. As it wasn’t a long ride, I wanted to include as much path and track as possible. 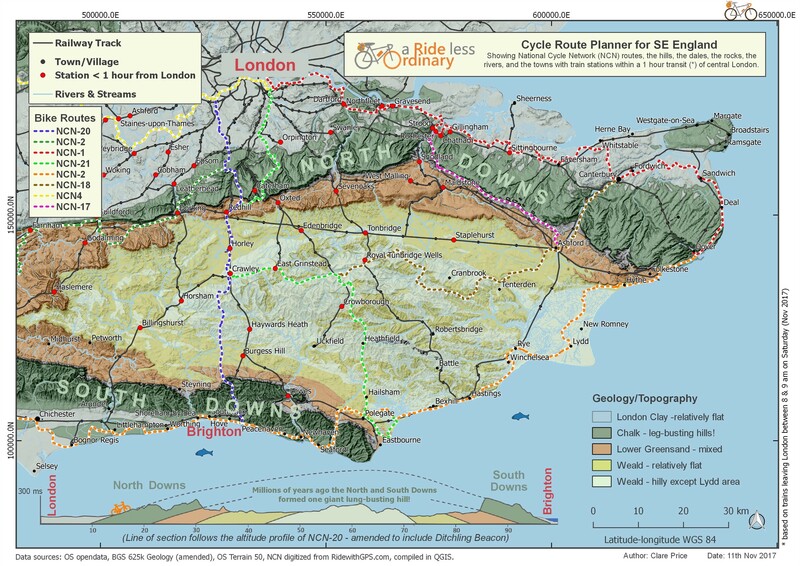 Having looked along the extent of the South Downs, there are very few tarmac roads which go over the top (Ditchling Beacon being the only one that springs to mind), the other roads are major A roads and stick to the valleys that cut through the Chalk. No fun to be had there. I set off through Firle up the scarp slope of the chalk, arriving at the top with steamed up glasses. I was now on the Souths Downs Way, which in retrospect may have been an easier choice of path, but I continued on, over a field and then a muddy track to the outskirts of Newhaven. It was rideable but no fun, too muddy and too steep for my bike, but it was thankfully a short section. I rode into Newhaven and past the town to explore the re-developed flats and houses opposite the harbour. I was half wondering whether there was somewhere pleasant to have a coffee and look out to sea. It was spitting with rain, a cold wind was blowing, and the skies were leaden. I found myself watching the sea-gulls picking at a giant pile of rubbish being loaded onto a rusty looking vessel, so I turned around and hoped the town was more welcoming. I looked along the High Street at a row of betting shops, a pound-land, a pawn-broker and a couple of chip wrappers caught in the breeze. My heart sank. At the top end of the High Street, I saw a coffee shop and initially didn’t want to stop. (Would somebody steal my bike? ), but there was something about it that changed my mind. It had a little positive hum to it, like a beacon of hope amidst a sea of despair. It was run by a Turkish guy who loved his shop and loved his job. The coffee was good and I was warm and dry. I really didn’t want to leave. But leave I did, to explore the Ouse valley. I had lots of vague ideas about a route back to Lewes from here, but I was confused by the presence of a bike path that only existed on certain maps, and seemed to end in the middle of nowhere. The minor road along the Ouse valley was a terrible combination of narrow and busy. After riding down it for a couple of hundreds yards, I was looking for any excuse to get off it, and I found one. The cycle path stuck to the levee along the Ouse, and was a dream of compacted grit (albeit scattered with sheep poo) until a mile or so in, where it stopped suddenly with a notice, telling me that ‘this section wasn’t surfaced at the request of the landowner’. It didn’t say no cycling so, always up for an off-road challenge, I carried on. The path followed the Ouse all the way to Lewes, as the map suggested. It was tough, but fun. As with all muddy sections, it started off as a minor distraction and just got worse. Mud attracts mud, and in the end stops the wheels turning, but this mud was fresh and sloppy. It slowed me down, but didn’t stop me, and there was no way I was turning back. When I at last slid across the final metres of the trail, I was surprised to read the following: Pedestrians may continue along the footpath. Cycling is not permitted. Ho hum, I’m not a clairvoyant! The final yards into Lewes were noisy. I couldn’t find a stick strong enough to remove the mud between my wheels and brakes, but I was close to home so I wasn’t overly worried. I stopped off in Lewes to pick up another Waitrose ready meal (Beef and dumplings – yum), sampled a quick pint of Harveys Best Bitter, cos it was 20 yards from the brewery, and limped back to base. I was surprised to wake to the sound of pattering rain on the roof, and equally surprised, when I finally got out of bed, to find clear blue skies and a thick layer of frost (or frozen rain) on everything, including my handlebars. I had left my bike in its uber-muddy state, hoping that the mud would have hardened and would come off easily. Being faced with the reality of it, was somewhat different. I had underestimated just how jammed everything was. I retreated back into the warmth to consider my options. My initial response was to load it up and hobble to the nearest station, but even then I had to get the wheels turning. An hour later, and aided by a garden hose and all sorts of ‘pokey’ instruments (to remove the icey clods! ), and the bike was road-worthy again. I loaded it up and set-off, with the vague intention of getting to Hastings if body and bike held together. They did! Riding over the Pevensey levels, past the reed beds and marsh-lands full of birds and low winter sunshine, felt like a reward for my perseverance. I decided to extend the reward with a very cheesy ham and cheese toasty from Pevensey Castle Tea-rooms. The remaining miles to Hastings were along the coast via Bexhill, which previous to my trip, I thought was a suburb of South London! How ignorant! My meanderings around the South East coastal towns from Gravesend to Newhaven, have been a constant surprise to me. Bexhill was unlike any other English seaside resort I have visited (albeit only in passing). I was so transfixed I did a loop through the town, before continuing on. The architecture along the sea-front spanned every decade from the 1900’s onward (including the 1935 modernist De La War pavilion), but all in pristine condition with not a chip wrapper in site. Even the beach-huts where all painted in immaculate white. What’s going on? And finally to Hastings, which from my very hasty perusal, appeared to be a happy mixture of Bexhill and Brighton, with a touch of Whitstable thrown in for good measure! The brand new pier supplied me with a great cup of coffee, and the Christmas Market provided Ukulele Christmas songs, hoards of white pagan earth mothers (??? gawd knows) and most importantly, a massive hog roast bap. I sat on the train back to London feeling tired but content ……the bits I was awake for, that izzzzzzzzzzzzzz. Notes to self: In hindsight, including off-roady days on an un-supported winter bike tour is asking for trouble! When I lived on the Island of Bali, we used to regularly witness a phenomenon locally known as ‘Bali Magic’; the unsuspecting tourist would arrive on the Island, and its irresistible lure would make such an impression on them, that life-changing decisions would be made, houses sold, savings plundered, all to chase the tropical dream. Provence has had a similar effect on me. I’m not going to sell-up or plunder, but I will definitely be back for more! Scroll down for route maps, GPS links and trip diary. I love tracing the randomness of why I end up going somewhere or doing something. The inconsequential start of it all. On this occasion, I was looking for cheap flights to Sri Lanka, but I forgot to fill in the destination box, so the search came up with a £10 return flight to somewhere obscure in France. I didn’t go there, but it led me to expand the search for cheap flights to France, and Nice had a couple of flights out of Gatwick at reasonable times of the day. I then did a quick search on Airbnb, and found exactly what I was looking for; a quirky self-contained hut, in an olive terrace at the edge of town, going for a song! Suddenly, me and my bike were off to explore the Maritime Alpes, staying just outside Nice, close to a small town called Vence. My recent solo cycling trips have all involved a lot of pre-holiday research regarding bike routes because, for me, that is a big part of the enjoyment. The discovery aspect is the thing that sets the stomach butterflies whirring. My initial search highlighted the Gorge de Verdon as a possible place to explore, but it wasn’t a realistic day trip, and would have been a tough two dayer (150 km days ain’t my thing! ), so I concentrated on the hills just to the north of Vence. It turned out to be some of my best ever days out on a bike. It was more than the rides though. On the evening of my arrival, I sat down outside my little wooden hut, on the edge of a pine and olive filled valley, inhaling the dry herby smells, feeling a total stillness that I haven’t felt for too long. I was hooked before my host even opened the door! For me, the summer months could have been better, both physically and emotionally, and I was slightly anxious that I had taken on too much, but there is one thing about cycling I totally get, and it is this; regardless of how fit I am (and baring illness or injury) I can always ride 50 miles, it doesn’t matter whether it takes me 5 hours or 3. I enjoy riding at 10 m/h as much as I do at 15 m/h. The latter just takes more practise. So I took it easy. The healthy food, minimal alcohol, restricted access to wifi, absence of telly and days of long slow rides in beautiful scenery, proved a perfect balm to my slightly weary soul. My rides on this trip made me more aware of what, for me, defines a great day out. My first two rides started by climbing the Col de Vence, (which is a 600 ms ascent from Vence at around 7% gradient), and then spent the rest of the day gradually losing height, so all the hard work is done in the first hour, and the rest of the day is a breeze. In the Alps proper, ascents up to cols are usually followed immediately by a descent of equal gradient, so you are either grafting or holding on for dear life, or going along a flat valley bottom! What characterises the rides around here is a combination of beautiful mountain scenery combined with balcony roads that keep high for 20 + kms. The roads were extremely quiet, so much so that my normal penchant for seeking small roads and tracks fell by the wayside, although I was tempted by a couple of options. More reasons to go back and explore! I found that a more challenging aspect of creating a route was making it the right length and amount of ascent. My ideal is 70 to 100 km with 1500 to 2000 ms of ascent (for those not familiar with alpine ascending, the low gradients make large ascents easier. I wouldn’t enjoy ascending 1500 ms in the Kent lanes). The sparsity of the road network limited the number of routes that fell within these criteria. I would say I was a bit on the cautious side, partly because the RidewithGPS ascent numbers were incorrect (Something I am looking into). Although all my pre-holiday planning was based on web-based maps via RidewithGPS, when I arrived I purchased a Michelin Map that proved very useful, mainly because it highlighted the picturesque roads, by putting a green line next to them. The map number is 115 of a series called Zoom France by Michelin (1;100,000, 1cm = 1km). I am sitting alone in a little hut at the end of a parched rocky terrace, filled with olive, oak and yukka plants, The light is starting to fade and I have a long evening in-front of me. My hut contains all I need in a physical sense, a little basic kitchen, a shower, a loo and a bed. I’ve got enough food to last a few days and my bike is put back together and ready to roll. No telly, no internet and no friends in the vicinity. For all my love of riding my bike in exotic locations, I certainly don’t relish the evenings alone. I look at it as one of the downsides that is, thankfully, more than compensated for in other ways. When I arrived yesterday evening, I sat outside my new bijou residence and felt like I’d been transported from another planet. The stillness was almost tangible, like I could cut a slice of it. Just a couple of squawking birds in the valley and the occasional lonely drone of a distant plane. I loved it, and knew that if I had been with someone else, I wouldn’t have felt it so intensely, but you can’t make a moment last forever and by 9 o’clock I was struggling to keep my eyes open, knowing full well that it was way too early to sleep. Tomorrow I will get up when I like, set off when I like & do a route I have chosen. I won’t have to wait for anybody, or have anybody wait for me and I won’t have to discuss any change of route or plan. The flip-side of this indulgence being, of course, that I miss out on the joys of sharing the experience. The memory is only mine, it won’t exist in any bodies else’s head, to be re-counted, exaggerated, marvelled at, commiserated over …….. So what has led me to this solo-cycling-state? I could just say, early retirement and lack of fellow cyclists with sufficient funds or free time, but that would not be the whole story. My cycling legacy seems to have set me down a road which at times feels a little deserted! Part of my problems lies with my style of riding; my preference to include un-surfaced roads which harks back to my mountain biking days, and partly because when I started riding, mass cycling events, Sportifs and club training rides (for women) didn’t exist. I didn’t start riding my bike to keep fit or compete, I rode to explore what was beyond the end of the street, and I learned to love where it took me, whether it was to the shops, touring around Scotland or discovering the hidden roads behind Nice. My enjoyment of it stems from a different era and try as I might, my kind of cycling means too much to me, to want to change it. On a brighter note, maybe there is a change on the horizon ……..adventure bikes, bike packing. Now you’re talking! Just need to grow a beard and buy a hand-stitched duck-quill saddlebag! It’s 10 pm which means I’ve lasted an hour longer than last night, and I haven’t even read my book yet. And then there’s tomorrow, with whatever that will bring. I’ve got a feeling it’s going to start with the Col de Vence …..,…………..Night Folks! Every day should start with a col! This particular one is around 8 kms of 7% and with fresh legs I soon got into a good rhythm. It’s a tad on the barren side to be picturesque but very popular with roadies and mtb’ers alike. At 10 am it was already hot and I was getting through my water, being sheltered from the wind until I got over the brow of the hill. My last km’s of the climb were spent in front of a wheezy French man who eventually past me, and told me that I had a good climbing style and that I was very lucky because today you could see Corsica across our ever-expanding view of the med, and so you could. Apparently, it only reveals itself 4 or 5 times a year. As I climbed I checked the trails to the right and left for their adventure road riding possibilities. My impression was that the terrain was far to rocky and dry to be enjoyable on thin tyres so I changed the route slightly and kept on the road, which was, in any case very quiet. After a rocket-fuelled coffee from a Ranch just passed the top of the Col, I started what was to turn into a massive descent, initially along the top of a deep ravine that kept me concentrating on the road, and then into a giant valley with limestone cliffs, beautiful conifer forests and medieval towns and villages clinging precariously to the hillsides. It was spectacular. I had lunch in a perched village called Cipieres, continuing on down the Gorges de Loup, which was equally breath-taking. By the bottom of the Gorge, and after what seemed like hours of down-hill, I was actually at a lower altitude than the start, something that I had not realised when putting the ride together, which meant an unanticipated 200 metre ascent to the town of Tourettes Sur Loup. Okay, the fun had to stop somewhere. To console myself, and replace a few lost calories I stopped for a butter and apple gallette and a boulle de cidre, before rolling back to Vence. It was a short confidence-boosting loop, full of beautiful views and empty roads. Tomorrows ride may well be meatier! 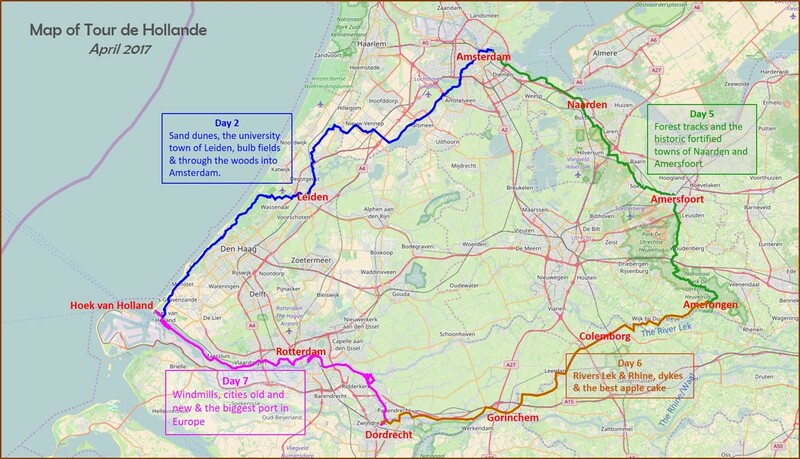 I had a short and a long loop in mind, but I left my decision until the routes divided, about 40 km into the ride. The long route was 97 km with 1700 m of ascent, so it was something I had to feel in the mood for before committing myself. I started up the Col de Vence for the second day in a row, and it was remarkably similar second time around(! ), except that Corsica was now in a bank of hazy cloud. I managed to pass the Ranch without stopping for coffee and carried on until Coursegoules, one of the many hillside villages, for my morning shot. I continued east, and after about 6 km of quiet, beautifully paved rolling descent, I started to catch breath-taking glimpses of the mountains across the River Var, to the higher Alps. By 11.20 I was at the route split and it was a no brainer, the long loop won the day. It was a decision I didn’t regret. It was 22 kms to Roquesteron, along what I can only describe as the most amazing ‘balcony’ road that I have ever ridden. It was perched about 600 meters above the valley floor, and kept at around that height for most of the way, until eventually dropping down into the town. The views were ……well, I’m running out of superlatives, but I’ll be riding it again before I leave, and I’ll try to think of some. Col de Vence again, but today Corsica was in the horizon haze. Roquesteron, has a church perched on top of a massive lump of rock, which I inadvertently climbed trying to find the town square. After carrying my bike up numerous steps and along narrow passages, I left the bike and continued on foot, only to realise that the town itself was across the river. Ho hum, it was a nice place to eat my sandwiches! The route back was along the same valley, but on the other side of the river and at a lower altitude. The road was empty, with plenty of fine views, but nothing could beat the morning ride. I knew the hardest bit of the day would be the last 25 kms, and so it was; against the wind and 300 ms back up to Vence, from the River Var, but I’m never in a hurry, the max gradient for the entire ride was 7% on the Col de Vence, which is not tough, and it seemed like I had spent most of the day, going down-hill enjoying the views. I just kept my legs turning. At Gattieres, where I knew my battle was won, I had a celebratory beer……..cos it’s rude not to! I am getting seriously hooked on this region! Tomorrow’s ride takes me along another balcony road, higher and longer than the one I have just discovered, that leads to the little town of Puget-Theniers, where I’m spending a night away from my Vence hide-away. The only problem being that according to the weather forecast, the skies fall-in at 2 pm, so an early start me thinks. Click here for video of Balcony road to Roquesteron. Well the skies have gone horribly grey and it’s 8am in the morning, so I have decided to switch my routes around. I had planned to do the ‘ultimate’ balcony road, higher and longer than the one I previously discovered. Is that possible? Anyway, I want to ride it on a blue-sky day, which could be tomorrow? I set off from Vence, keeping high and going east through Carros and on up to Bouyon. It was a day to send your hunting dogs out! I passed a pair with GPS collars on and couple of minutes later passed some people standing in their drive following the dogs progress on mobile phones. Hunting without having to leave home. I wasn’t quite sure what to make of it! My favourite balcony road was still a delight, even on a cloudy day. I continued to Roquesteron and decided to start the climb up to Sigale before having my lunch with a lofty view, next to an abandoned house with a lonely guard dog in it’s front garden. Dogs again. I carried on past Sigale, and, you guessed it, got attacked by a dog. It didn’t actually bite but chased me up the road and hastened my journey upwards. I shouted at it, when I thought it was far enough away, but it heard and renewed its chase with increased vigour. That taught me. By the time I got to the base of the Col de Raphael, I was hot and bothered so I changed into something short-sleeved and baggy, drank some water and felt a whole lot better. The Col do Rapheal from the south was pretty tame, but I was relieved to be swooping down into the town of Puget Theniers; my base for the night. Forgin’ deeper into them hills. The road near Sigale. Motor-cyclists looking back in awe. Does he realize he has just biked around the fault plane of a thrusted anticline?! My last-minute hotel booking secured me a room on the wrong side of town, opposite the station and next to a Citroen garage. Having said that Puget Theniers is not known for its good looks. I know that because the map that I bought in Vence has a ‘star’ system, whereby it places up to 4 starts next to anything that is picturesque, and Puget didn’t even qualify for one. I was looking forward to my meal out, (because, let’s face it, my hotel room was about as inspiring as a Premier Inn on the outskirts of Slough) but unfortunately, I got the timing all wrong, and as I left the Hotel the skies opened and rumbled, and I had to dive into the nearest place, which turned out to be a Pizza restaurant. I pined for my little hut in Vence, with a pork chop in the fridge! For all my moans about the Hotel, it did a pretty comprehensive Continental breakfast, and I set off to tackle the north face of the Col de Raphael with a full and content stomach, and found the climb less onerous than I had imagined. My glasses steamed up half way, and I took them off to take a photo, then promptly left them on the wall, so if anyone’s passing …. At the top of the col, I turned left onto the D27; the road of my dreams, the eternal balcony! It didn’t disappoint. Every twist and turn, and there were many, revealed a different view. I think the saying feeling on top of the world is apt. I took it slow, cos it wasn’t a long ride and I had no-one waiting on, or for me. I had no time that I had to beat. My GPS was off. I stopped at Ascros for my morning coffee and got speaking to a local cyclist, who said I should stay there next time I came. Like many parts of the world, you don’t have to go far off the tourist trail to experience another world. Most of the villages I went through were not affluent and a coffee cost between 1.30 and 1.50 Euros (unlike close to Nice, where I paid 6 Euros!!). I descended slowly and then at more pace to the River Var, sitting in its wide and industrial valley, and decided to take the Route des Iscles up to Le Broc, a much pleasanter alternative to the bike path along the river. With the end in sight, I cycled up to the touristy village of St Jeannet for my final beer and for some reason, possibly because it was the last cycling day, I ordered a large one, much to the amusement of the three women I was sharing a table with. The trouble was it was one those ‘continental ones’ that stray way above 5% alcohol, which I only realised when I got up to leave. I set off confidently into the main village, but couldn’t find a way out. The streets just got smaller and steeper. I ended up having to cycle back past the Bar and was for some reason on the wrong side of the road at that particular point. Oh dear, these English! I did get back in one piece, but not before I had explored a section of disused railway and an old viaduct, which would have served to complete the ultimate balcony experience, if it hadn’t ended in a blocked off tunnel that had been converted into someone’s garage. Shame! I did think at this point, that if someone had been riding with me, they would have strangled me by now! Note to self. Check the beer strength before ordering. Sometimes not having a plan can lead you into trouble, and other times it can lead to a pleasant surprise. Yesterday my unplanned and rare shopping trip yielded a pleasant surprise. On returning from my trip, my shopping bag consisted of a Throw from John Lewis, 3 stalks of lemon grass, a book of cycling meditations and a packet of my favourite Indonesian sweets. It’s not that any of the purchases where particularly intentional, it’s just the way the day unfolded……and my favourite buy? The book of cycling meditations, of course! As I left the house, I realised I didn’t want to take the tube, so I picked up a coffee from the Bean Around Town guy opposite the tube station, and took the number 88 bus. I got the front seat upstairs, drank my coffee and watched the world go by. As the bus turned into Regent Street, I noticed the Pinarello shop, and wondered at living in an age where a mono-brand cycling shop could afford the elegant Regent Street address. I was jolted out of my musing by the sudden recollection that the Specialized Concept store was in Covent Garden (and if anybody could give me some information about when the Women’s 2018 Diverge Comp was going to be on sale in the UK, it would be them), except that when I got to Slingsby Place, it wasn’t there anymore! Ho hum, perhaps only the likes of Pinarello can afford the luxury of a central London show-room? It did mean, however, that I was dangerously close to my favourite shop, Stanfords. I immersed myself in maps and travel books and thoughts of far-off lands, and eventually came across a little book called Mindful thoughts for Cyclists. I flicked to the last page and read the title ‘Sufficient unto itself’. It’s rare that I pick up a cycling book that resonates with me to such a degree. It’s not that I cycle to be mindful, it’s that cycling, by it’s very nature, can be a mindful activity, and if you practice it long enough, it teaches you to overcome suffering. Then you know you are hooked for life! In my relatively new life as a job-less (but financially secure) person, I am still learning how to freewheel without a sense of guilt or duty. Taking my feet of the pedals and slowing down my pace of life, has meant dealing with everything that I didn’t address when I was busy, and for me, this has meant facing negative as well as positive thoughts. This means that I am learning to be more mindful when I am off the bike as well as on. What of the other items? Well, the lemon grass was consumed in a Jamie Oliver fishcake, and the Onde Onde were consumed with relish and very little mindfulness whilst walking along Gerrard Street. The Throw has to be returned because it’s not big enough! Life in the fast lane eh! The house is strangely quiet, the skies are leaden; perfect conditions for a quick blog post (it’s that or clean my chain!). I’ve just said good-bye to my brother Stephen, and Sister-in-law Kate, after a weekend visit with their 30 year old tandem called Lucy (neither of them have the faintest memory of why that name was chosen!). They voluntarily requested to try a couple of ‘less ordinary’ rides and I was more than happy to oblige. The first ride was a city ride, which is described in a previous blog, and requires urban riding skills, like negotiating kissing gates, ramps, cobbles, tight corners and on occasion, the art of going slow on busy paths shared with pedestrians. When we set out I was a bit concerned that it would be a lot of stop, start and dismounting for the Tandem, but Stephen relished the challenge. In fact, I swear the more I warned him of up and coming challenges, the more determined he was to not to have to put his foot down. The were, however, a couple of unavoidable dismounts, one being the pedestrian flyover at Bow Lock, which is designed for horses and before the age of gentle inclines. Half way up the incline, with closed spaced cobble ridges for the horses hoofs (and with Kate on the back making her displeasure known), he realised he wasn’t going to make it to the top. There was much hurried un-cleating……… and laughter from the two guys riding behind me! Culinary memories include the ever reliable and ultimate scotch-egg experience at the Cutty Sark pub in Greenwich, devouring home-made ham and tomato sandwiches in the rain, under a tree somewhere north of the Victoria and Albert dock, and a very refined cup of tea at St Katherines Dock……in the sun. On Sunday we decided to go to Whitstable; a trip down memory lane for Kate as she grew up in Chatham. Lucy the Tandem started to show her age and there were a few moments at the start, when I doubted we would actually leave Whitstable. Her buckled back wheel resulted in many brake and mudguard adjustments! We eventually made head-way east along the coastal path through Herne Bay, past Kate’s grandparents off-license (now an angling association) to Reculver for a cuppa and a muffin. The route turned landwards across Wade Marsh and we continued through the villages of Plucks Gutter and Stodmarsh, for a quick spot of very late lunch at Canterbury before returning to Whitstable on the Crab and Winkle Way. This is a traffic free cycle route that uses part of a disused railway line that had the honour of being the first regular steam passenger railway in the world, and a lot of it is downhill, which is always welcome after lunch. We got back to the car at 5 o’clock and took 3 hours to get home, through gnarly traffic and what the BBC Weatherman described as Gert’s moist remnants …..not something to be recommended! (Gert was the name of a North Atlantic hurricane, for those that don’t study the weather). It was all a tad on the bonkers side, and reminded me of all the good things associated with belonging to a slightly eccentric family! I woke early in a static caravan on the outskirts of Whitstable. It was another perfect summer’s day. The kind of day that as a kid, you would remember as the best day of the holidays; sunburn, ice-cream, getting sand in your knickers & sea up your nose. I made the most of the Breakfast that my kind Airbnb host had left me, and read through some Whitstable tourist leaflets lying on the table, one informing me of it’s former and current famous inhabitants, among them, Alan Davies, Peter Cushing (Hammer Horror Films), Harry Hill and Janet Street Porter. The previous evenings excursion into the town where still lingering on my mind. After my evening meal sitting at the harbours edge, I decided to walk/ride/push my bike along the sea-front back to the caravan park. It was a decision that I didn’t regret. It seemed like the whole of Whitstable had the same idea. Between each wooden groyne something different, champagne swilling revelers, somebody singing with a guitar, a group around a fire, people on deck chairs outside stripy beach huts, kayakers returning before the light finally dies, and everybody facing the same way, looking at the same thing; the sun slowly setting. Nobody wanted to miss the moment. The rare hot days of summer change the UK into a place that only exists in our dreams for most of the year, but when it does becomes reality Whitstable sea-front really is a lovely place to be. Needless to say, the photographic possibilities where endless but my phone batteries where flat, so I only managed a couple of shots. Todays ride was to be a recovery ride after the previous days exertions with the Bello Vela ladies along the Pilgrims Way, and I intended to ‘wibble’ my way along the coast towards Ramsgate on Sustrans Route 15. Wibble I did (l think that wibbling is slower than wobbling), with temperatures already in the mid 20’s at 9 oclock, I wasn’t going anywhere fast! The broad concrete path took me past the suburbs of Swalecliffe, Hampton and Herne Bay to the ruined medieval towers of St Marys at Reculver, and then across Wade Marsh to Margate, where I stopped for a cup of coffee in the old Town Square, outside The Bulls Head Pub where Eric Morecambe celebrated his wedding reception to the pub landlords daughter. I could feel a theme coming on. I had been told about Margate’s recent re-birth and thriving art scene, and it certainly had all the signs of being in the process of a slightly bohemian re-gentrification (and still had plenty of ‘edge’ to make it interesting). I wasn’t aware of it’s famous connections until I did some post ride googling. Margate: Tracey Emin born there (Turner Contemporary Art Gallery), . TS Elliott wrote part of the ‘The Wasteland’ here. (recuperating from a nervous breakdown!). A favorite with Turner ‘painter of light’ who was sent there when he was 11, later was reputed to have fallen for Mrs Booths Lodging house. Dunkers and Dippers. The ruby Lounge and Haekels experience? Broadstairs: Charles Dickens, Barnaby Rudge …….to be continued! This is the story of the Bella Velo Cycling Clubs summer trip to the sea. It was a road ride full of unforeseen adventures that pushed us all to various limits. We conquered extreme heat, punctures, thigh-burning hills, came close to mutiny and possibly learnt a little about riding off-road, but most of all it was a rollicking good day out! When I saw a Bella Velo FB invitation to ride along the Pilgrims Way to Whitstable, with the promise of fish and chips by the sea, I was both interested and intrigued. Intrigued because the BV ladies don’t normally stray so far from West London, and normally run training rides with an emphasis on the performance side of cycling (speed, endurance …..). This was an A to B ride along an ancient trackway, more renowned for its history than it’s Strava segments! It turned into something of an epic; not a ‘monster, never to be repeated’ kind of epic, but an epic none the less. The day got off to a strange start for me due to an unusual early morning dream, which I hoped wasn’t an omen for things to come. It involved getting caught up in a massive Hindu procession (complete with elephants! ), along Whitstable High Street, forcing me to miss my rendez-vous at Cadence bike shop. I put it down to worrying about having to ride at a slightly faster pace than I would normally ride. Unlike my dream, I was up early and arrived at Cadence bike shop bang on the pre-arranged meeting time. After standing there alone for 50 minutes, I momentarily wondered if they’d bumped into the Elephants, but was soon thinking much worse, so I was very relieved to see Helen leading a large group across the traffic lights at the top of Anerley Hill. The GPS route was to blame for the delay, and if ever there was an augur for things to come, it was that. We swooped down the steep chalk escarpment, and turned left onto a small lane and our journey along the Pilgrims Way began. This section of the ancient by-way, as with many other sections, is a fun roller-coaster ride on a single-track tarmac road, with great views of the Chalk Downs to the left and the Kent Weald to the right. With the long climb up the downs out of the way, I managed to keep up, and we rode well as pack, making good progress until Trottiscliffe, where the road came to an untimely end at a No Entry sign. Keeping to the GPS track that everyone had downloaded (herein referred to as the purple line), was looking like it would get us into a spot of legal trouble. Having ridden this section earlier on in the year, I knew that it was possible to continue along a footpath at the base of the chalk escarpment, but persuading some people that their bike wasn’t going to explode or dis-integrate was difficult. We didn’t really have much choice as keeping on the tarmac would mean back-tracking, which was equally unappealing to some people. So off we set up the side of a field to join the ‘real’ Pilgrims Way, through the woods on smooth compacted mud. I suddenly found myself propelled from the back to the front of the pack telling people to get their bums off the seat and keep their upper body loose! Although there was a bit of dissent among the ranks, I also detected a few smiles at the adventure of it all. Apart from a quick pit-stop at the Duke of Wellington in Ryarsh, following ‘the purple line’ continued to challenge our GPS and riding skills, taking us on a smorgasbord of small tarmac roads, nettle-lined footpaths, jeep tracks, lock-gates and pedestrian flyovers, passed housing estates, vineyards, pretty villages and across the Medway at Allington Lock to the little village of Boxley, where Helen was reliably informed by the locals in the Kings Arms, that the ‘purple line’ was not the most direct route to Whitstable and involved a thigh-burning hill. I detected a distinct and growing lack of enthusiasm for much more ‘road less traveled’. I’m not entirely sure what happened next, except to say that I found myself continuing on ‘the purple line’ along a beautiful section of the Pilgrims Way with Lou, who vowed she wouldn’t leave me in a ditch somewhere gasping for air, and I vowed that my Garmin and I would get her to Whitstable. We had no idea whether the group was in front, behind or piling along the A2, but regardless of which group you where in, the last big challenge of the day had to be faced. We had to get back over the North Downs, which meant going up the chalk escarpment at Hollingbourne. In the heat of one of the hottest days of the year and with legs sadly depleted, I think I can speak for most when I say I was accessing the dregs of my resources. With the worst hill done and dusted we were enjoying a speedy descent when we suddenly came upon the rest of the group mending a puncture, so quite by chance we were back together again. As we rode the last 15 miles into Whitstable, a sort of tired calm descended on the group, a collective determination to see it through, and as the sea came into view over the top of the sea-wall a little cheer went up. Out of 15 starters, 11 pairs of legs rode down Whitstable High Street to the harbour, to a very well-earned portion of Fish and Chips, and not an elephant in sight! Well done all! By most people’s definition, this ride falls into the Adventure road-bike category, something that is close to my heart and a major inspiration for this blog. Adventure road-biking is partly about ‘going slower and getting lost’. If you would like to learn a bit more about it, please check out my previous post on Adventure road-biking here. Bella Velo Cycling Club: This is a Facebook Group run by women, which has turned into a great forum for anything bike related happening in West London. They organise their own training and social rides, but also advertise other club and group rides, as well as the occasional themed social evening. Catch them if you can, they’re great fun! Dirty Weekend: Advertised as London’s first fun and social cycling club. Offers a very varied menu of activities and levels of riding, with emphasis on the social. Breeze Rides: Set-up by British Cycling to encourage women of all abilities to ride, from the competitive level to the total beginner. If you don’t know where to start, but know you want to get out and ride your bike more, these are the guys to get in touch with. Just use their simple search box at the top of their website to find, groups, rides or cycling buddies near you. Back in the days when having 5 gears on your bike was aspirational, I suddenly found myself in possession of a 3-speed Ladies Triumph Tourer. I was 11 and it took me a year to grow into it, but during that time, I started to understand that although my old bike looked a whole lot better, the Triumph Tourer was like riding a spirited colt. It just wanted to be ridden; hard and fast, up hill and down dale, particularly down dale! The particular dale I am thinking of, is a dip on the A5 just outside Shrewsbury. I would put the bike in the hardest gear at the top of the hill and pedal like fury, out of the saddle, and if I gained enough speed, I would have enough momentum to roll up the other side without pedaling, with the added bonus of sitting on the saddle. Although it was born out of necessity, because initially my legs weren’t long enough to pedal efficiently with my bum on the seat, riding that particular stretch of the A5 became a regular test of my strength and judgement way beyond those years. There was just one problem with my new best friend, and that was its totally shabby appearance. It let me down. Nobody could see its fine qualities but me, and I hated that. The blue frame was chipped down to it’s silvery undercoat and the wheel rims where so rusty that no amount of wire wool would restore their steel shine. I had to somehow make it’s appearance match it’s indomitable spirit! I discussed my restoration plans with my Dad, and decided that there were going to be no half measures. The plan was to re-spray the frame and replace the rims. This involved totally disassembling the bike & wheels; every component was unscrewed, dismantled and either cleaned or thrown away for replacement at a later date. I was to be bike-less for as long as it took, and it was funded with pocket money and Birthday and Christmas presents. It took just over a year. Would I have embarked on it had I known the hardships and frustrations that lay ahead?! Disassembling the bike and re-spraying the frame was relatively straight forward. The re-spray involved a huge amount of preparation, and I still remember the frame dangling by a piece of string from the ceiling of the ‘scullery’ (an unused room at the bottom of the rambling, slightly dilapidated Victorian house we had recently moved to). I gutted the room so it was just me (togged up in overalls and a face-mask), my bike and a can of spray. The process lasted weeks with base layers, a couple of colour layers and final lacquers and sealants all needing to be dried and rubbed down. At this stage the project was on time, on budget and fun, but it wasn’t to last. Nowadays the idea of replacing the rims seems ridiculous, but back then it was a simple case of economics. There was no way I could afford to replace a whole set of wheels, particularly as the rear wheel included the Sturmey Archer 3-speed hub, so I bought a spoke key and dissembled the wheels into rim, spokes and hub. I toured various bike shops for an affordable pair of 26″ rims and finally found a little shop on the ‘wrong’ side of town which sold me a pair. The Deal was that I would work out the spoke pattern and lace the spokes, and my Dad would ‘true’ the wheel. As I was nearing the end of the ‘lacing’ process, I realised to my horror that the number of spoke holes left on the hub were more than the number left on the rim, so I ended up with a couple of spokes dangling from the hub with no where to go. Apparently spoke numbers and wheel design change with the same regularity as gear ratios, and things had moved on since the creation of the Ladies Triumph Tourer. I was gutted, but hoped that the man in the shop would understand, and either allow me to exchange the rims for a pair with the right number of spoke holes, or give me my money back. He did neither, claiming that he had seen me drop the rims after I had left the shop when I bought them. It couldn’t have been further from the truth. I didn’t drop them and they were as ‘true’ as the day they left the shop. My Dad, who is normally very quiet and mild mannered, marched to the shop in a rage and argued my case, but the shop-owner dug his heels in. So my dream was in tatters. I can’t remember exactly how long we debated our options, but in the end we threatened to take him to court, and he grudgingly gave us some money back, but not the full amount. The whole thing left me out of pocket and way behind schedule. The new rims, which we ordered from another bike shop were more expensive and took an age to arrive, but arrive they did! With the wheels and frame finished, it was just a case of re-building the bike. Cranks with cotter pins, and unsealed bottom brackets, that could be opened with a six-inch nail and a hammer; it was fantastically unsophisticated, but woe betide me if I chipped my newly sprayed frame! I replaced all the cables as well as the pedals, mud-gaurds (with massive mud-flap on the front), chain-guard, pump, saddle & rack all the highest specifications that my money could buy and all colour co-ordinated, of course. It was, at last ready to be revealed to an unsuspecting public. People who had once scoffed at its peeling exterior would gasp in wonder as it zoomed by in a whirl of shiny blue and silver. It would take me across continents and over undiscovered mountain ranges. Really? It had taken over 2 years from dream to reality, because the dreaming bit was at least a year, and over that period I had learnt a lot about bikes, so much in fact, that what I really wanted was a 27″ wheeled, 10- speed, Reynolds 531 framed bike with Bluemels mud-gaurds and a top end of the range Campagnola group-set. It felt disloyal even thinking about such a thing after all that work. I was torn, but it wasn’t an option anyway. My Ladies Triumph Tourer took me on one tour, before I was to leave it in the shed for a 5-speed Royal Enfield Ladies racing bike, which I got for my 15th birthday. Here are a couple of pictures of the Meole Wheelers first tour in 1980. Pictured left; final preparations! Pictured right; I was 14 and sitting on my beloved Ladies Triumph Tourer (on the right). There is a story within this story that I feel strangely compelled to share. I was a child that found fitting in at school really tough and, at the time, I couldn’t express how that made me feel; I was lucky if my credibility rating was neutral, but when I was 11 it was at an all-time low. What was really behind my ambitions to turn something that nobody noticed, into something that people would admire? Me, of course. I am the bike.